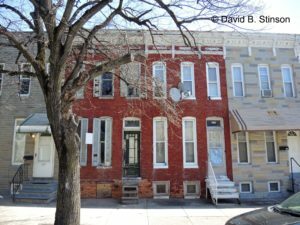 Thirty years ago this April, the City of Baltimore tore down a three-story brick structure at 519 North Howard Street. 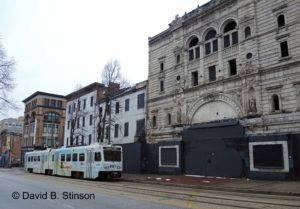 It was demolished along with the rest of the east side of the 500 block of North Howard Street in an attempt to spruce up a portion of the decaying, former theatrical and shopping district. 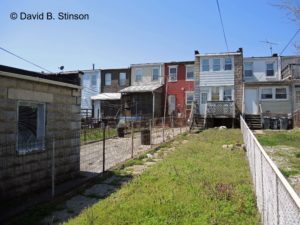 Redevelopment would come soon, or so the city thought. It did not, and, in the process, Baltimore wiped away a building that once housed an important part of the city’s history. 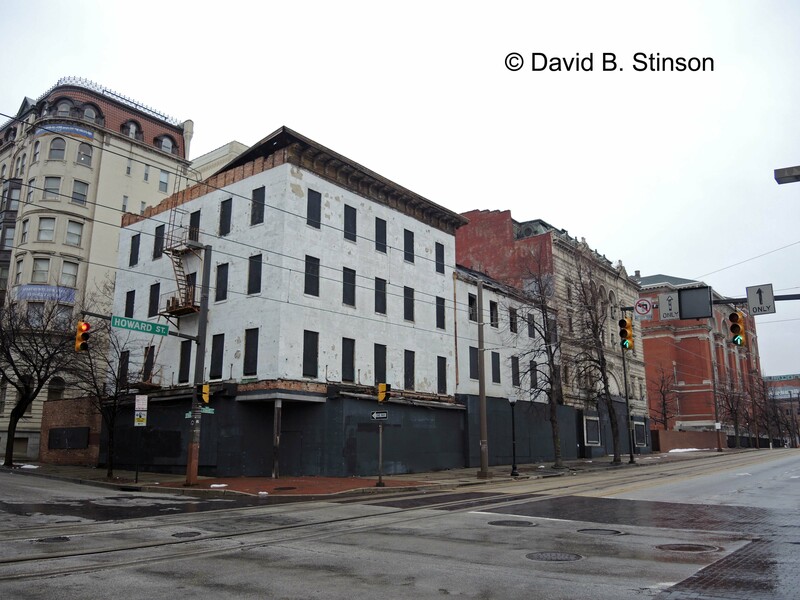 From 1897 to 1915, the building at 519 North Howard housed the Diamond Cafe -the brainchild of future baseball Hall of Famers John J. McGraw and Wilbert Robinson, then both members of the National League Baltimore Orioles. 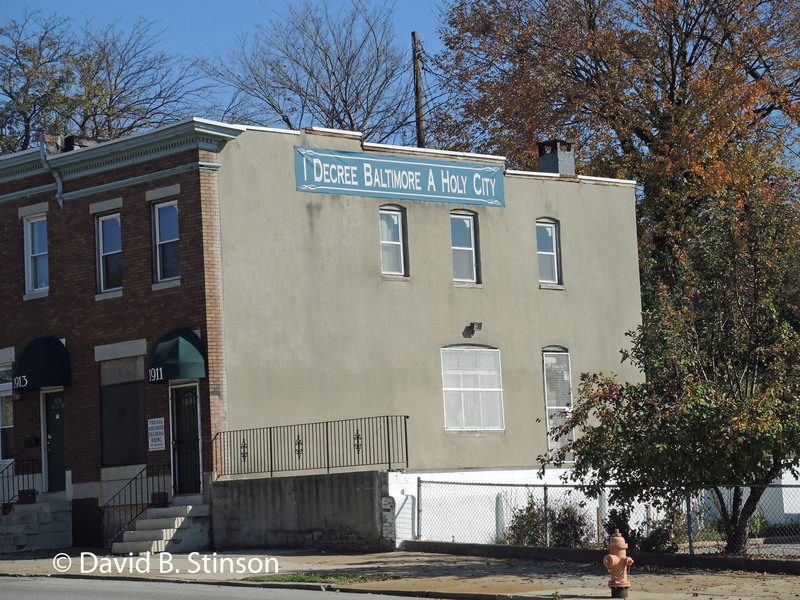 The Diamond Cafe is believed to be Baltimore’s first sports bar. 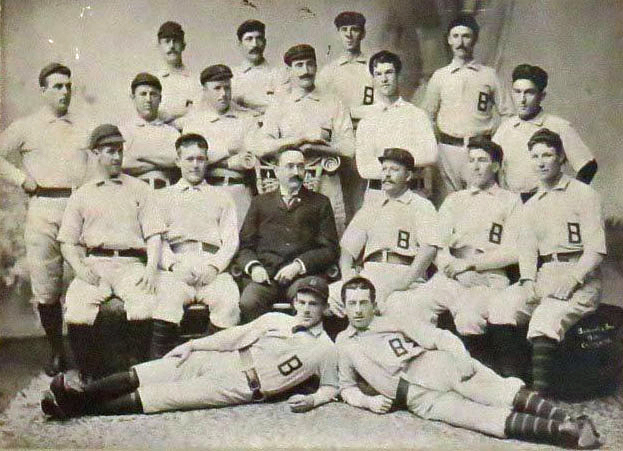 At the time, the National League Orioles were at the height of their success and fame, having won their third consecutive National League Pennant in the Fall of 1896. 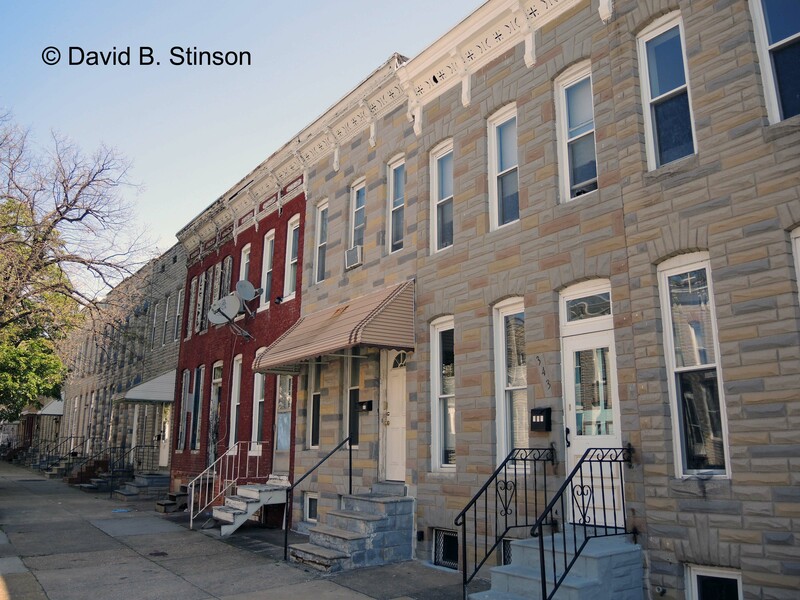 McGraw and Robinson were next door neighbors and lived on the 2700 block of St. Paul Street, less than two miles north of the Diamond Cafe. 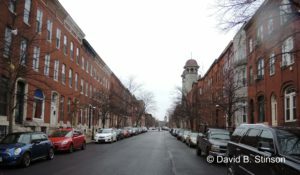 Locating the Diamond Cafe on North Howard Street was a smart business move. 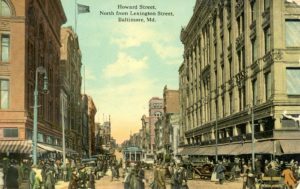 From Centre Street to the north, and Lexington Street to the south, North Howard Street was one of Baltimore’s finest shopping districts. 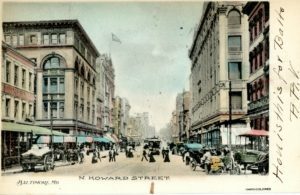 Anchored by Lexington Market to the west, North Howard Street boasted department stores such as Hutzler’s, Hochschild Kohn’s, and Hecht’s. 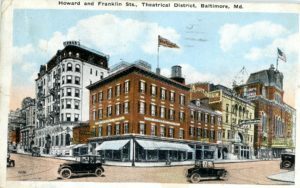 At the intersection of Franklin Street and North Howard Street was Baltimore’s Theatrical District, which included some of the city’s finest theaters. The Diamond Cafe was located right in the middle of that block opposite several theaters. 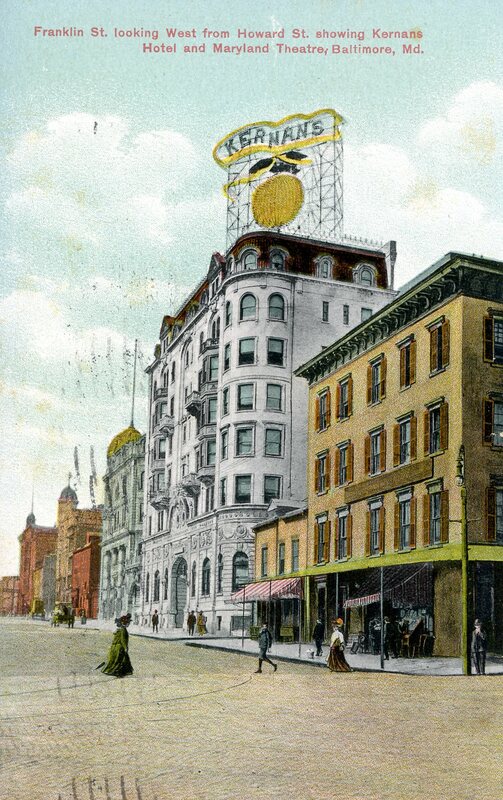 The Kernans Hotel and Maryland Theatre sat at the southwest corner of North Howard Street and Franklin Street. 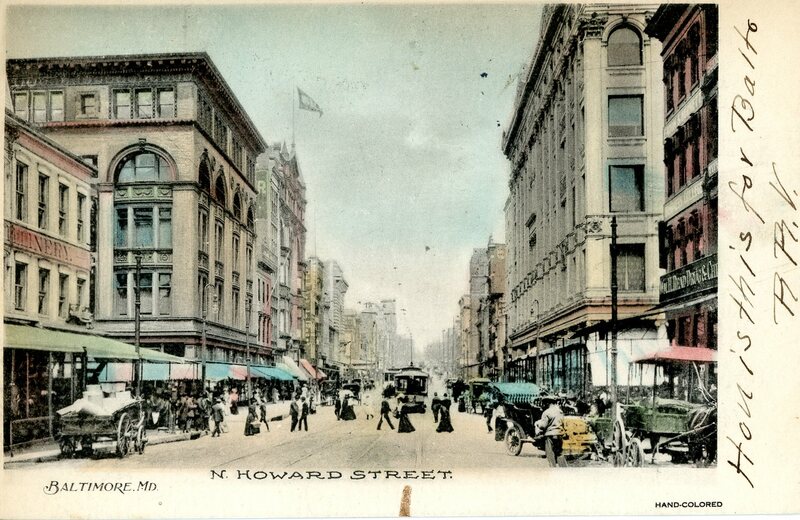 Franklin Street, Looking West from Howard Street, showing Kernans Hotel and Maryland Theatre, Baltimore, Maryland Circa 1911 (postcard published by Baltimore Stationary Company). 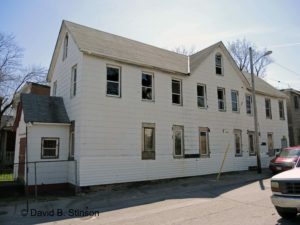 The building that housed the Kernans Hotel still stands to this day. 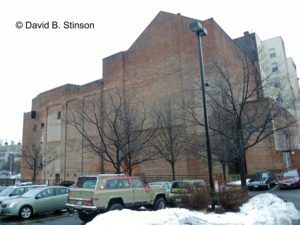 In the photograph below, the Maryland Theatre is shown as well, although that building was demolished by the city in 2017. 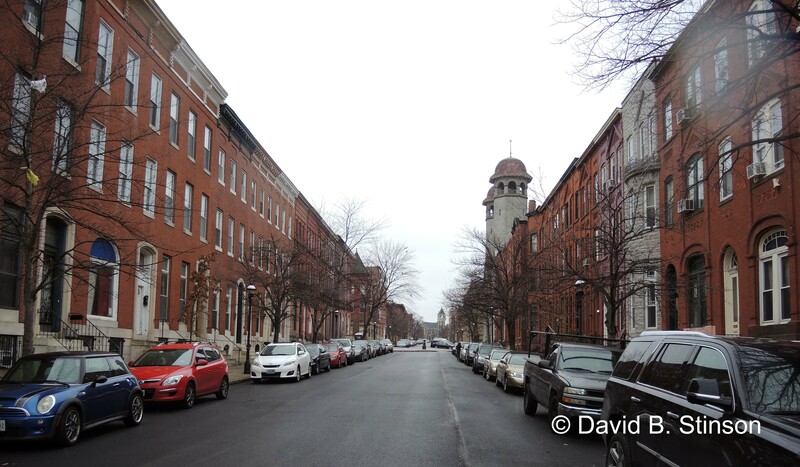 Franklin Street Looking West from Howard Street showing former Kernans Hotel and Maryland Theatre, Baltimore, Maryland (February 3, 2016). 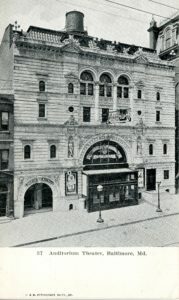 The Auditorium Theater at 506 North Howard, later renamed the Mayfair Theater, was constructed in 1904. Previously, another theater building occupied the site. The Mayfair closed in 1986, but somehow the structure still remains to this day, even after being damaged by a fire a few years ago. 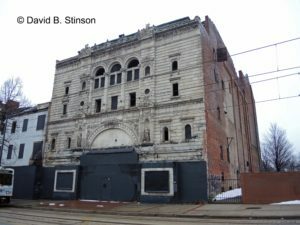 Hope remains that the former Mayfair Theater will be restored or repurposed, rather than have it meet the same fate so many of its contemporaries have met. In a vacant lot to the right of the former Mayfair Theater once stood the Academy of Music at 516 North Howard, which was directly across the street from 519 North Howard. 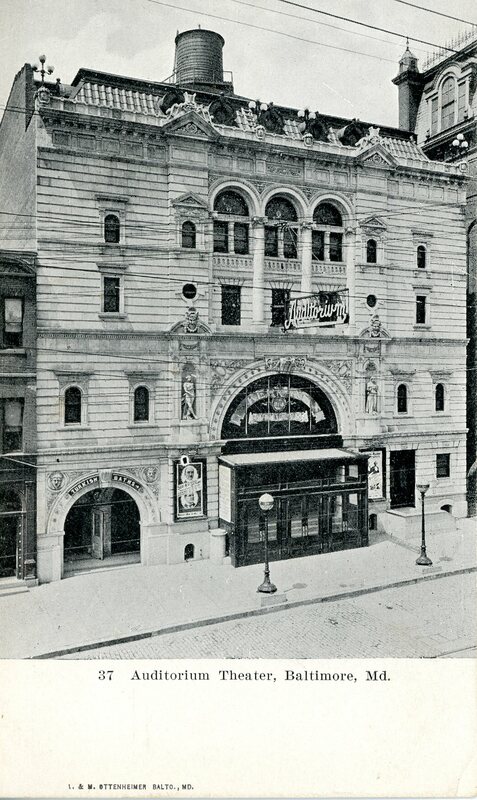 The Academy of Music was constructed in 1875 and demolished 50 years later to make way for the Stanley Crandall Theater in 1927. 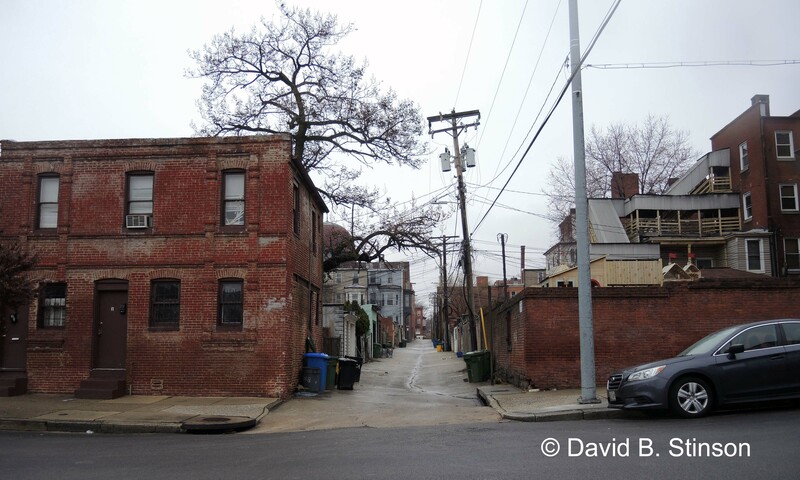 500 Block of North Howard Street (even numbers) February 3, 2016. The Stanley Theater was demolished in 1965 and the site has been a parking lot ever since. 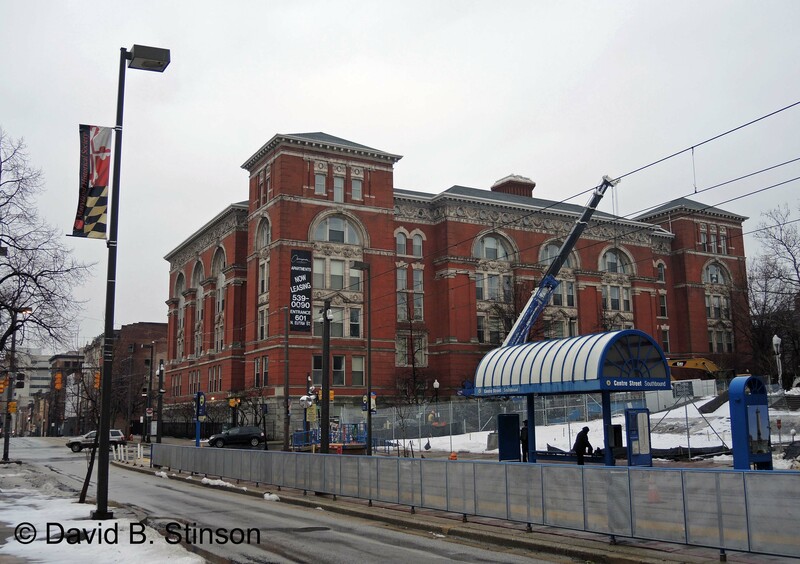 Former Site of the Academy of Music and the Stanley Theater, North Howard Street, Baltimore, Maryland. 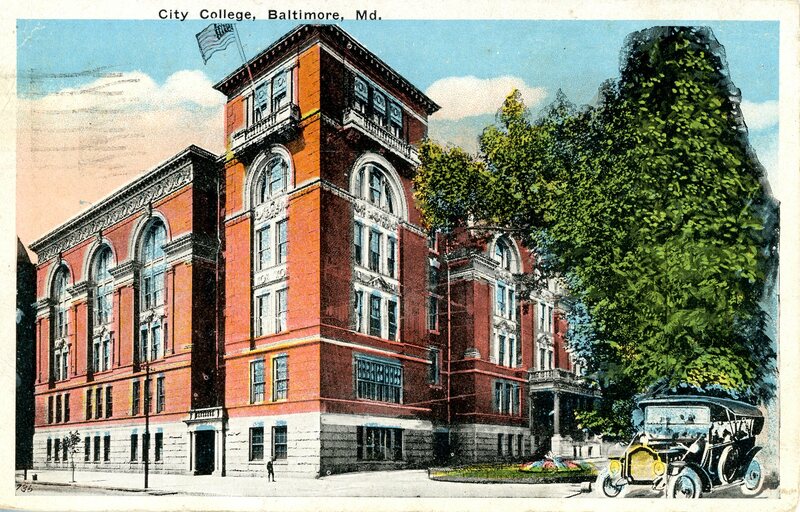 At the southwest corner of North Howard Street and Centre Street is the former site of Baltimore City College. The building still stands and, from the outside, appears much as it did when it was a college. The building now houses the Chesapeake Commons Apartments. According to accounts in the Baltimore Sun, as early as 1885, W.H. Beach operated an establishment at 519 North Howard known as Beach’s Restaurant or Beach’s Hall. Beach leased his restaurant for use by the Cribb Club, which boasted the famous bare-knuckle fighter Jake Kilrain as an instructor who taught the art of self-defense and held sparring exhibitions. Beach was a friend of Kilrain’s and Beach adorned his restaurant with pictures of the pugilist in action. Kilrain would return to Beach’s Restaurant in 1889 after his fighting days were over, and again March 1894, where he refereed three boxing contests at Beach’s Hall. The second of the three sparring sets featured Joseph Brown, brother of Baltimore Orioles pitcher Stub Brown. 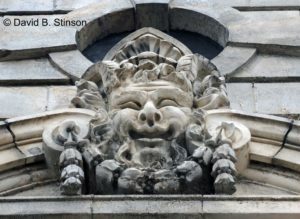 Beach’s Restaurant also hosted political meetings such as the Thom Democratic Association of the 11th Ward which was organized at Beach’s Hall in September 1889, and the German-American Democratic Club of the 11th Ward, which held a mass meeting in October 1889. In October 1892, the Neptune Boat Club organized the Neptune Club’s Foot-Ball Team at Beach’s Restaurant with J.W. Dawson Jr. elected as Manager and D.J. Hauer as Captain. 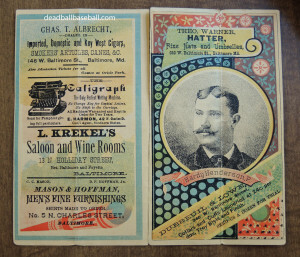 In December 1896, Beach put the stock and fixtures of his saloon up for sale, and that following February, McGraw and Robinson leased the building. When the Diamond Cafe opened in 1897, it included elegant bowling and billiard parlors, and a gymnasium. Four steel bowling alleys were located in the rear of the first floor and billiards were located on the second floor. 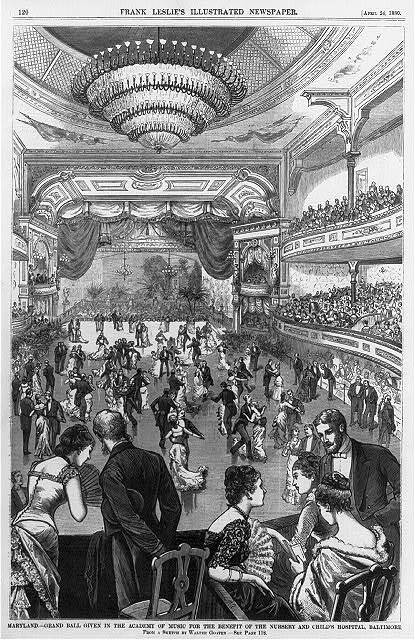 In 1898, additional bowling alleys were installed on the second floor, a reflection of the growing popularity of the sport. Legend has it that the used, splintered bowling pins at the Diamond Cafe were shaved down and used for duck pin bowling. 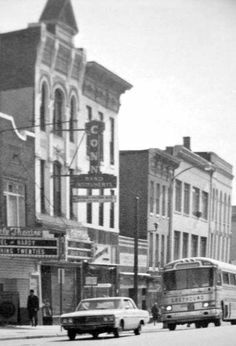 City bowling leagues were formed at the Diamond Cafe, and city bowling championships were played there. Baseball fans filled the Diamond Cafe to be near their idols and hear their stories while dining on cold cuts and crab cakes. In October 1901, Joe “Iron Man” McGinnity, a member of the American League Baltimore Orioles in 1901 and 1902, built a shooting gallery on a lot adjoining the Diamond Cafe. In July 1902, McGraw sold his interest in the Diamond Cafe to Robinson, just prior to McGraw’s departure from Baltimore and subsequent move to New York City, where he assumed the reigns as manager of the New York Giants. Robinson’s playing days ended after the 1902 season, but he continued to operate the Diamond another 10 years while also working as a pitching coach for McGraw’s New York Giants. 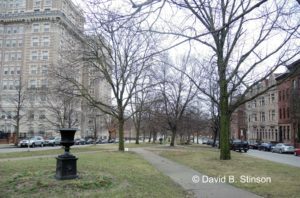 In May 1906, a fire damaged the second and third floors of 519 North Howard, but Robinson rebuilt the Diamond, and in 1912, Robinson purchased property adjoining the Diamond with thoughts of tearing down the adjoining building and constructing a five story hotel structure on that site, adding also an additional two stories to 519 North Howard. 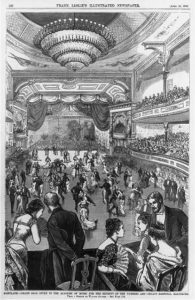 The Diamond, like Beach’s Hall before it, also held private events and political rallies during this time. For example, in October 1912, Samuel Gompers, President of the American Federation of Labor, attended a cigar makers banquet held at the Diamond. In January 1913, Robinson decided to devote more of his time to the upcoming baseball season and he sold his interest in the Diamond to Saloon Keeper August Wagener. 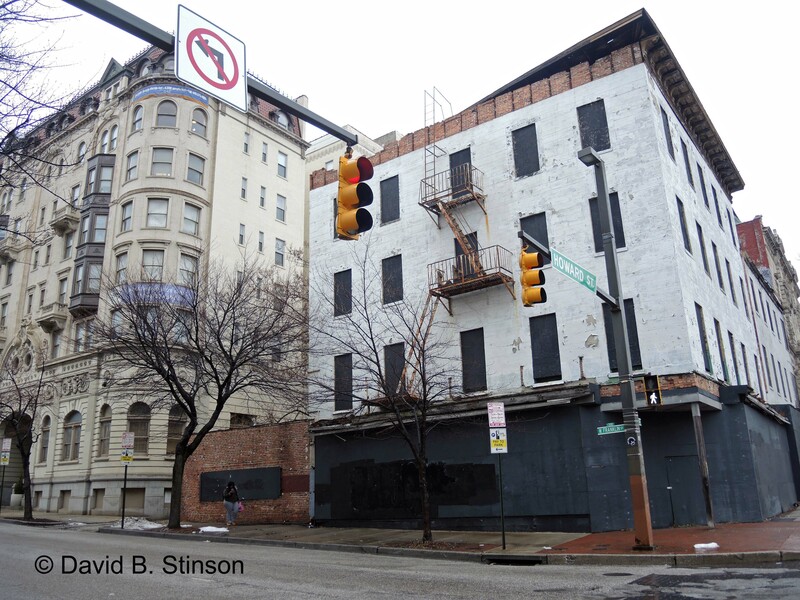 Robinson vowed he would one day return to Baltimore to open a hotel. 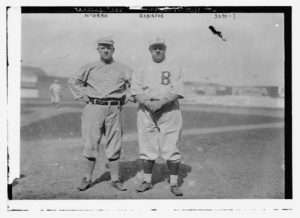 However, in 1914, Robinson became manager of the National League’s Brooklyn franchise and any thought of returning to Baltimore faded. 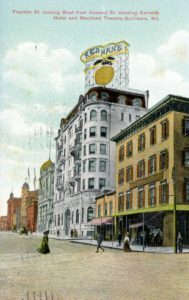 Wagener’s ownership of the Diamond was short-lived and May 1915, the Diamond was put up for sale. In August 1915, Wagener filed for bankruptcy, and in October 1916, E. T. Newell & Company, Auctioneers, leased 519 North Howard from the Beach Estate, turning the Diamond Cafe into a three story warehouse. 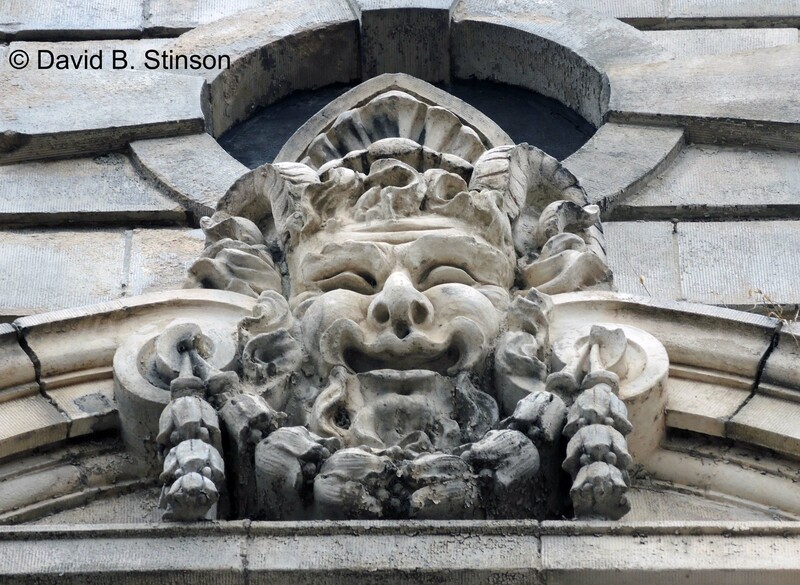 In September 1927, Paul Caplan Company, Auctioneers, took over the lease, staying until September 1932. The National Furniture Company leased the building up until 1936, and from that point on, a variety of shops and business occupied some or all of the building, including the The Hub Piano Company in 1940 (featuring the “most complete stock of Victor and Blue Bird Records in Baltimore” (Baltimore Sun Feb. 1940)), the Carla School of Dance in 1944 (“Baltimore’s newest toe ballet studio for children and adult” (Baltimore Sun, Sept. 1944)), the Radio and Record Bar from 1945 to 1948, the Trustworthy Christian Books and Accessories Store in 1956, and the R.L. Polk Co. City Directory in 1961 and 1962. 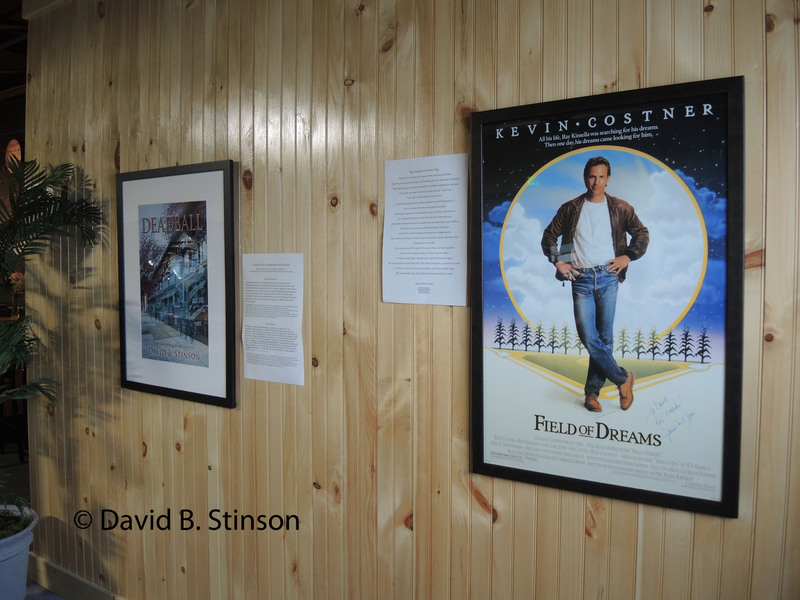 There exists no known photograph of the Diamond Cafe, taken either inside or out. For some Baltimore baseball history enthusiasts, it is considered the Holy Grail of Baltimore sports-related photographs. 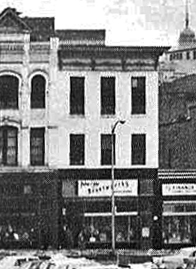 The earliest known photograph of the building dates to 1924 and was published in James H. Bready’s book, The Home Team, showing only a corner of the building and the south-facing side wall advertising Newell’s Auctioneers. 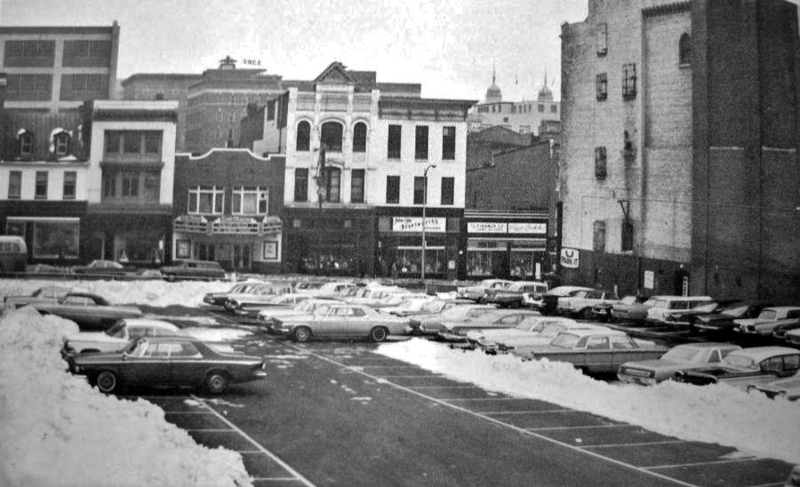 The photograph of the block below was taken in 1967 and is reproduced here courtesy of the wonderful Baltimore history website, kilduffs.com. 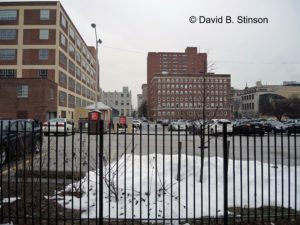 An asphalt parking lot currently adorns the spot where the Diamond once stood, perhaps encapsulating the remnants of the building’s former cellar. At some point in time, perhaps soon, redevelopment of the 500 block of North Howard Street will come to pass. When it does, care should be taken first to excavate the site to recover whatever can be saved of the former site of the Diamond Cafe. 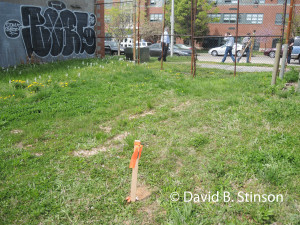 Perhaps buried amongst the debris beneath the asphalt are remnants of Baltimore’s baseball history or perhaps a portion of the Diamond’s steel bowling alleys. Redevelopment presents a rare opportunity to reverse, in at least a small way, the unfortunate decision 30 years ago that destroyed an important part of Baltimore’s history. Whatever historical artifacts still exist at the site should be investigated, understood, and, in some manner, preserved. 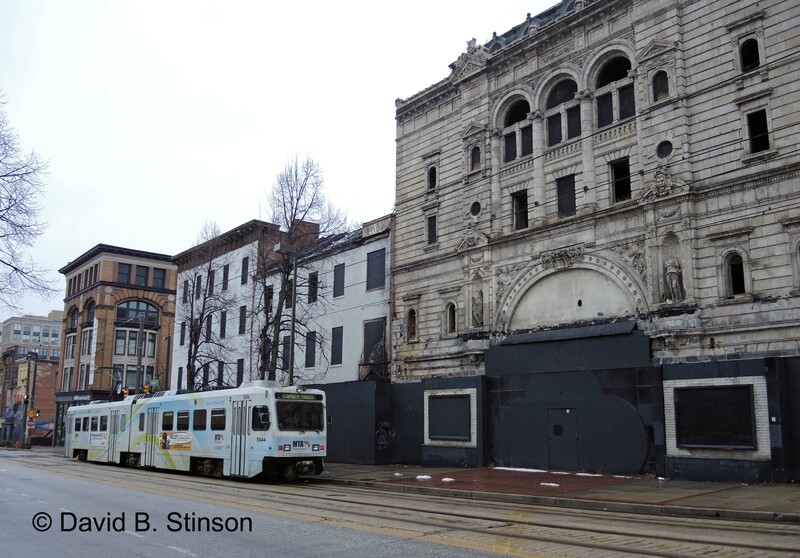 This entry is filed under DBS Blog and tagged 500 block of North Howard Street, 506 North Howard Street, 516 North Howard Street, 519 North Howard, Academy of Music, American League Baltimore Orioles, Auditorium Theater, August Wagener, Baltimore Bowling History, Baltimore City College, Baltimore Orioles, Baltimore's first sports bar, Baltimore's Theater District, Beach's Hall, Beach's Restaurant, Carla School of Dance, Centre Street, Chesapeake Commons Apartments, Cribb Club, Diamond Cafe, duck pin bowling, E.T. Newell & Company, Franklin Street, Hub Piano Company, Jake Kilrain, James H. Bready, Joe Iron Man McGinnity, John McGraw, Joseph Brown, Kernans Hotel, Lexington Market, Lexington Street, Maryland Theatre, Mayfair Theater, National Furniture Company, National League Baltimore Orioles, Neptune Football Team, Paul Caplan Company, pugilist, R.L. Polk Company City Directory, Radio and Record Bar, Stanley Theater, Stub Brown, The Home Team, Thom Democratic Club Associaton, Trustworthy Christian Books and Accessories, W.H. Beach, Wilbert Robinson. 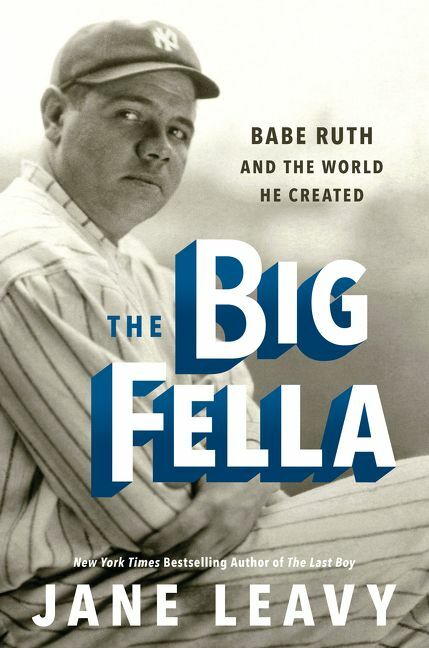 Jane Leavy’s new book The Big Fella, Babe Ruth and the World He Created, is a fascinating look at the life of Babe Ruth, including his humble beginnings in Baltimore, Maryland. 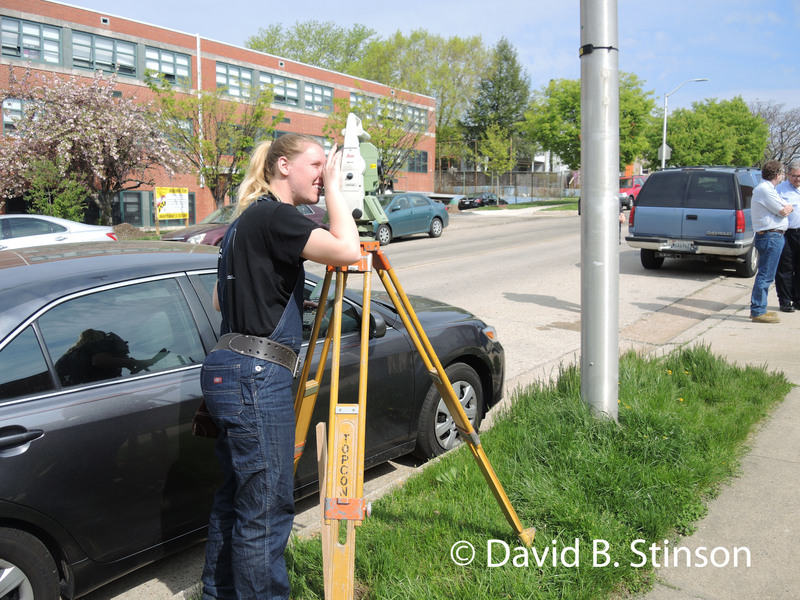 Ms. Leavy’s attention to detail, and her Herculean efforts to uncover unknown and long-forgotten facts about Babe Ruth’s life in Baltimore, helps bring the Big Fella’s formative years in Baltimore into focus, providing a clearer understanding of the years he spent in Baltimore and the impact those years had on his personality and ultimately on his trajectory to the pinnacle of the sports and entertainment world. Researching and writing Big Fella consumed eight years of Ms. Leavy’s life, and the accolades she has received for her efforts, and the resulting book, are well earned. 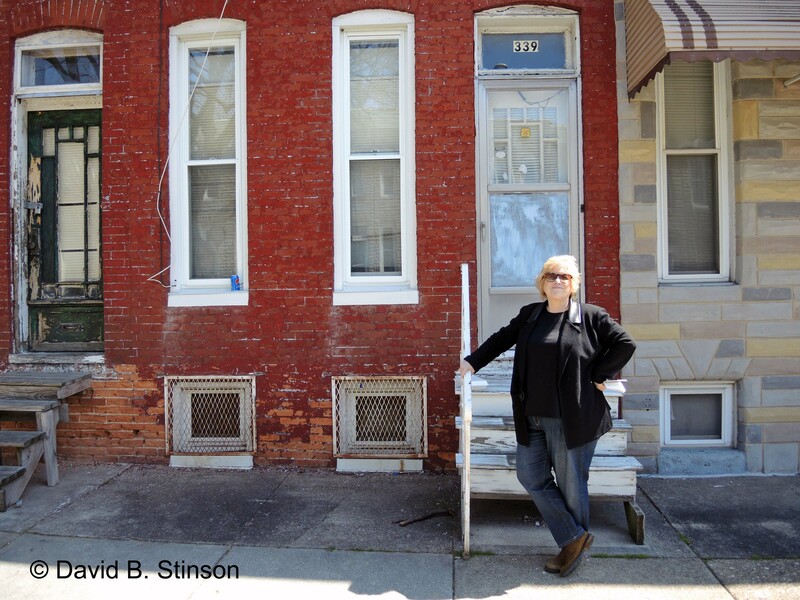 In April 2016, I had the good fortune of tagging along with Ms. Leavy as she toured Baltimore in search of Babe Ruth’s past. 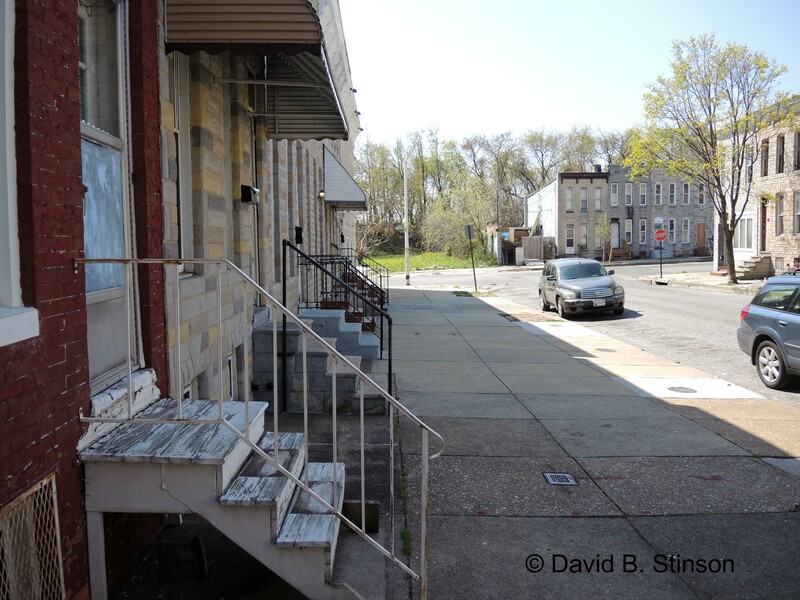 Our first stop was the former site of St. Mary’s Industrial School for Boys, once located at 3225 Wilkens Avenue, just west of downtown Baltimore. 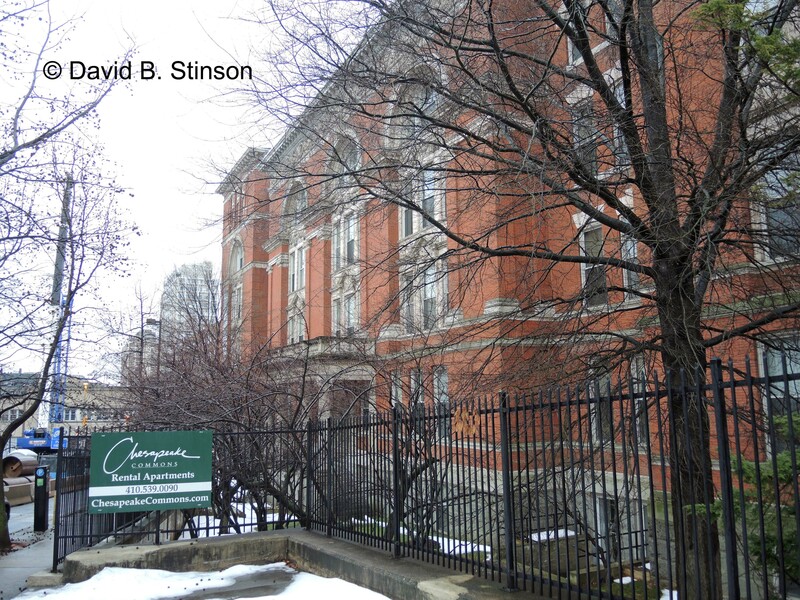 In 1902, Babe Ruth was sent to live at St. Mary’s at the behest of his father, George Herman Ruth, Sr.
After St. Mary’s closed in 1950, the Archdiocese of Baltimore transformed the property into Cardinal Gibbons School, which opened in 1962 and closed in 2010. At the time of our visit, the site recently had been purchased by St. Agnes Hospital. 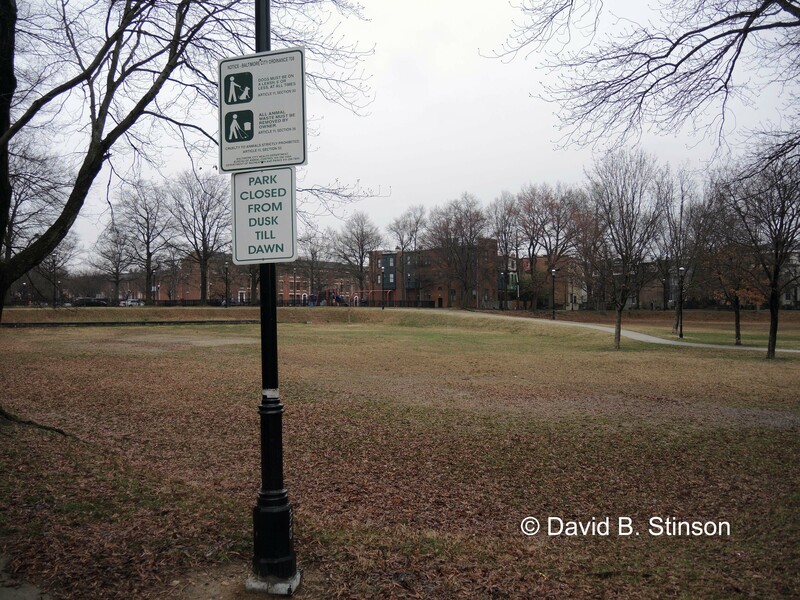 The field where Babe Ruth once played baseball as a boy was in the process of being converted from grass to artificial turf under the direction of the Cal Ripken, Sr. Foundation. 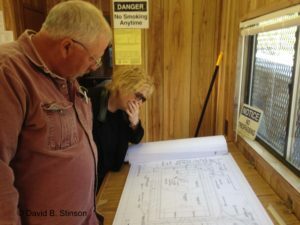 One of the construction managers at the work site on the day of our visit was kind enough to show Ms. Leavy the construction plans for the field. The field is adjacent to the Industrial Arts Building, perhaps the most historically-important building still on the site, dating back to the days when Babe Ruth lived at St. Mary’s. 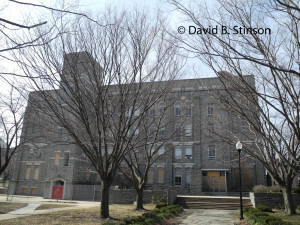 In that building, Babe Ruth learned to make shirt collars, a trade the Xaverian Brothers who ran St. Mary’s taught Babe Ruth as part of his education there. 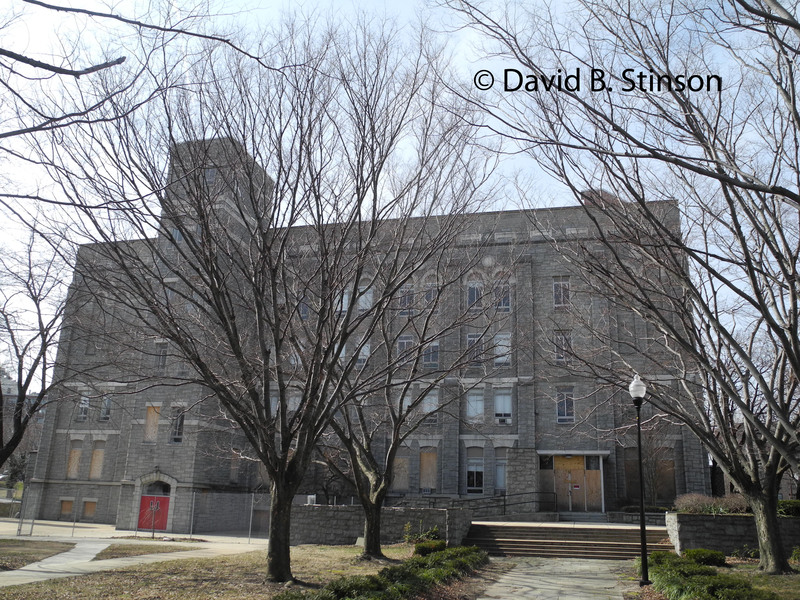 During our visit, Brian Cromer, a project manager and caretaker of the former St. Mary’s site, gave us a tour, including the Industrial Arts Building and the former Xaverian Brothers residence hall. 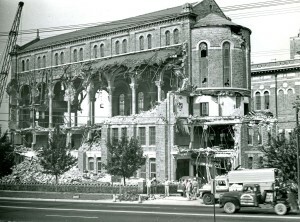 The residence hall was constructed in the 1920s after a 1919 fire at St. Mary’s destroyed a majority of buildings at the school. The residence hall is constructed of stones salvaged from the fire. 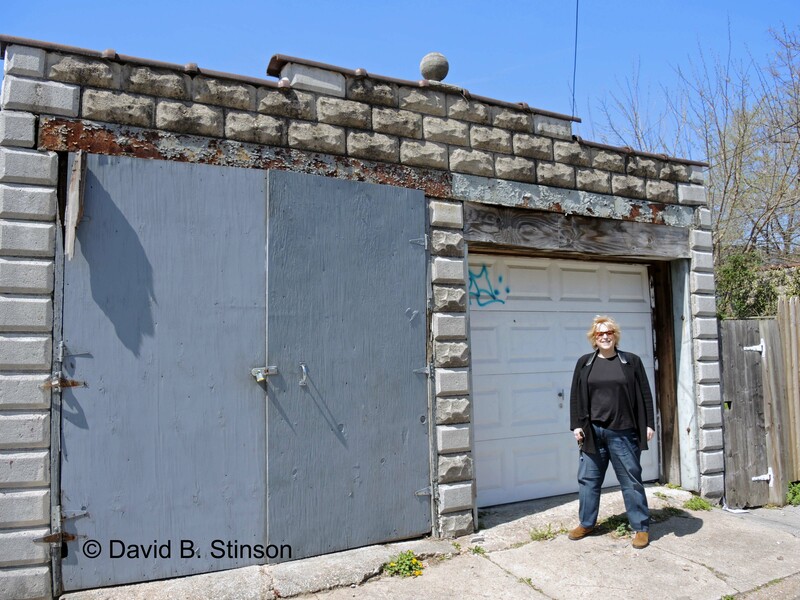 Author Jane Leavy Taking Notes, Standing Next to former Xaverian Brothers Residence Hall. Babe Ruth helped the Xaverian Brothers raise money to rebuild St. Mary’s. The large stone building in the background of the photo below was built in part from funds raised by Babe Ruth after the fire. One additional structure that predates the 1919 fire, and remains at the site, is a brick smoke stack seen in the photo below. 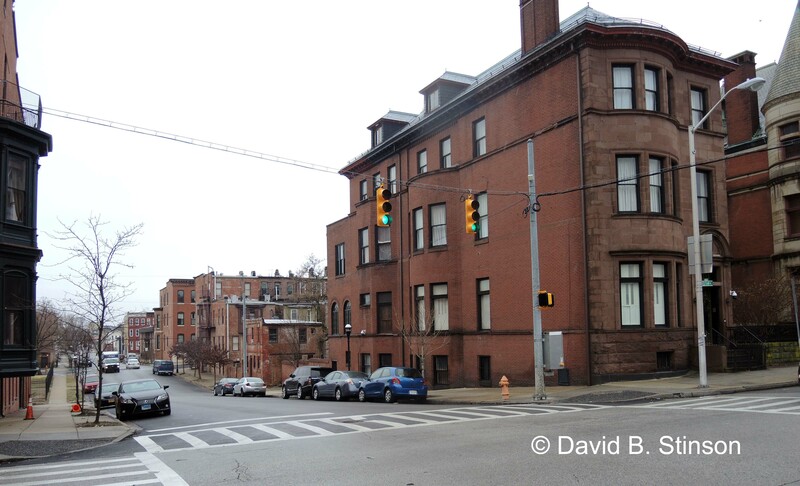 After finishing our tour of the the former St. Mary’s site, we drove just one mile northeast on Franklin Avenue to the house where Babe Ruth lived until he was two years old. Located on the southeast corner of Frederick Avenue and Font Hill Road, the house once was owned by Babe Ruth’s paternal grandfather. 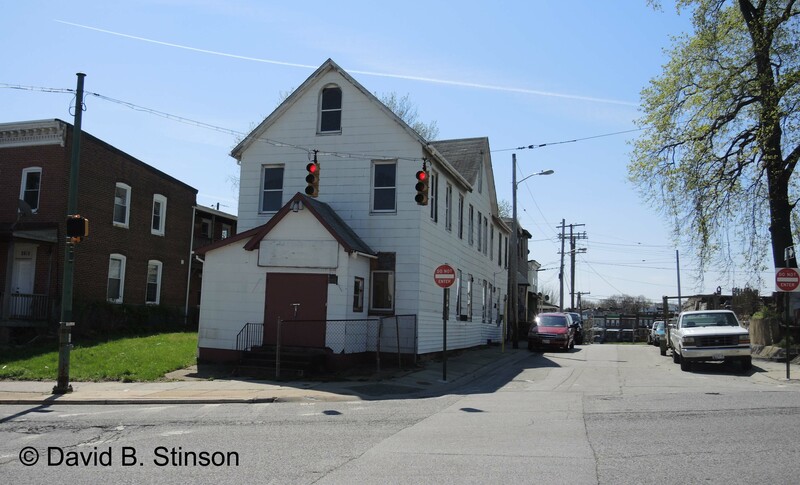 The house is located catercorner from Mount Olive Cemetery. 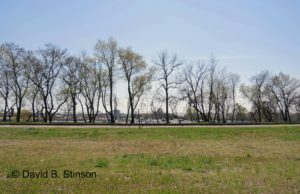 The photos seen here were taken during our trip in April 2016. 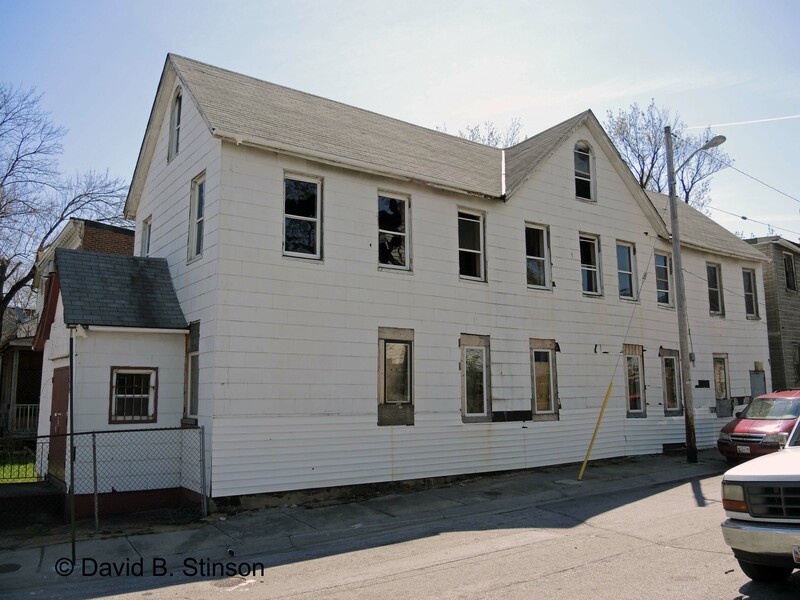 Since that time, the house was boarded up and its fate now seems uncertain. 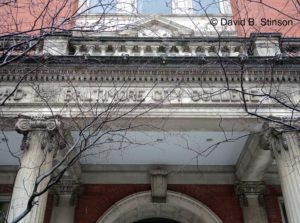 Given the history of the building, perhaps the City of Baltimore could recognize the significance of the structure and help encourage its preservation. 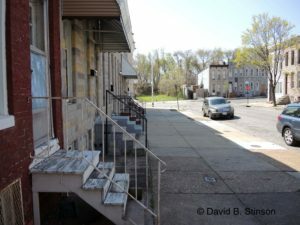 Our journey next took us to a half mile further east on Frederick Avenue to the Westside Shopping center, located between Frederick Avenue to the north and Wilkins Avenue to the south, at Catherine Street. As Ms. Leavy notes in her book Big Fella, the site of this shopping center was once occupied by the William Wilkens & Co., Manufacturers of Steam-Curled Hair and Bristles. 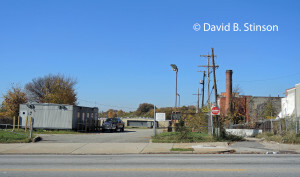 Babe Ruth would have passed this expansive industry and the stockyards that once surrounded the area while traveling Wilkens Avenue on his way to and from St. Mary’s. The William Wilkens & Co. factory was located in a hollow. According to Ms. Leavy, pigskins and horsehides were placed in the sun to dry in an area of the property once known as Hogs Hair Hill. 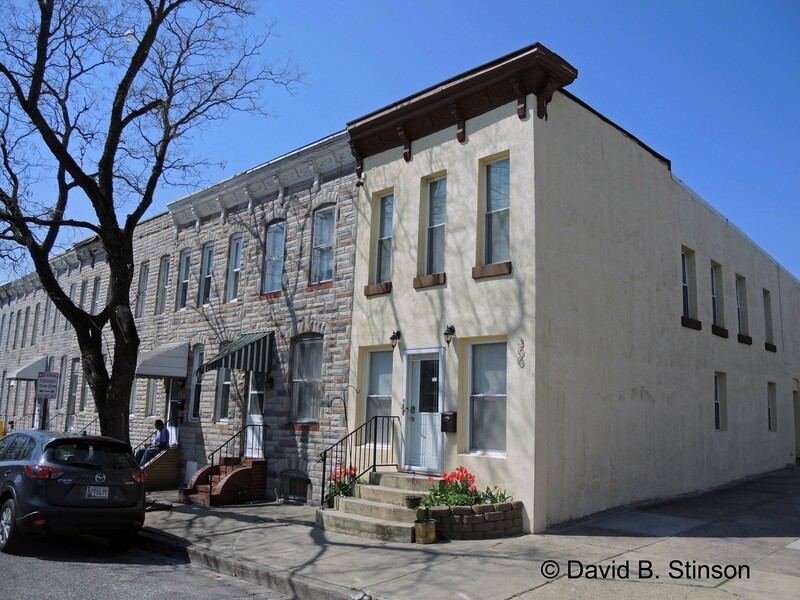 One mile east of the former site of William Wilkens & Co., and five blocks from the eastern terminus of Wilkens Avenue, is Woodyear Street, where Babe Ruth lived from ages 2 to 6. 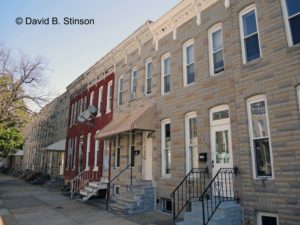 His family lived in a 12-foot wide row house at 339 South Woodyear Street. 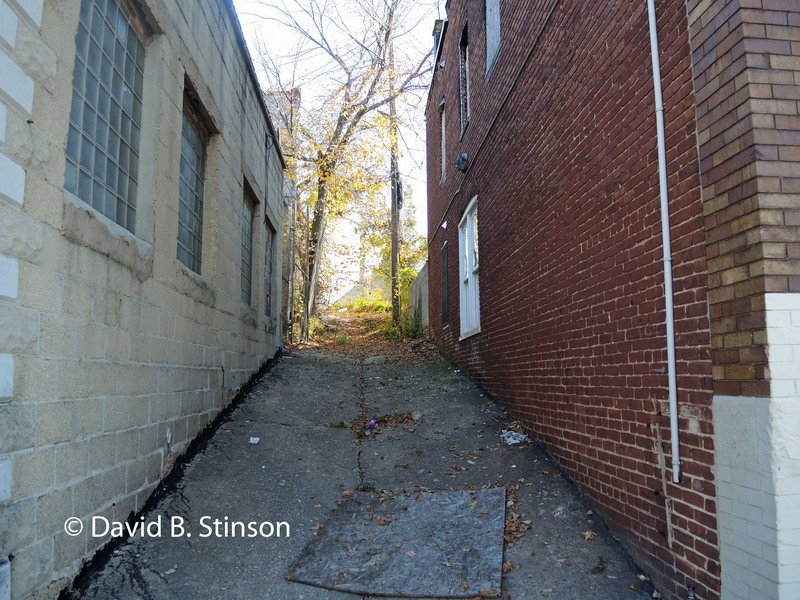 In the photo above, 339 is the red brick structure on the right, with white, wooden steps. 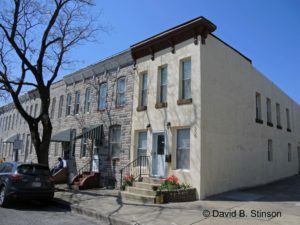 Babe Ruth’s uncle, John Ruth, lived with his family in the adjoining house at 341 South Woodyear Street (the row house with the metal awning to the right of 339 South Woodyear). Babe Ruth’s father owned, with his brother John, the Baltimore Lightning Rod Works, which they ran out of the garage located in the backyard of their adjacent properties. 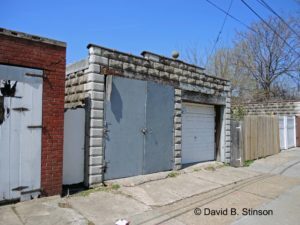 That garage still stands on the site, fronted by South Carey Street, across from the Mt. 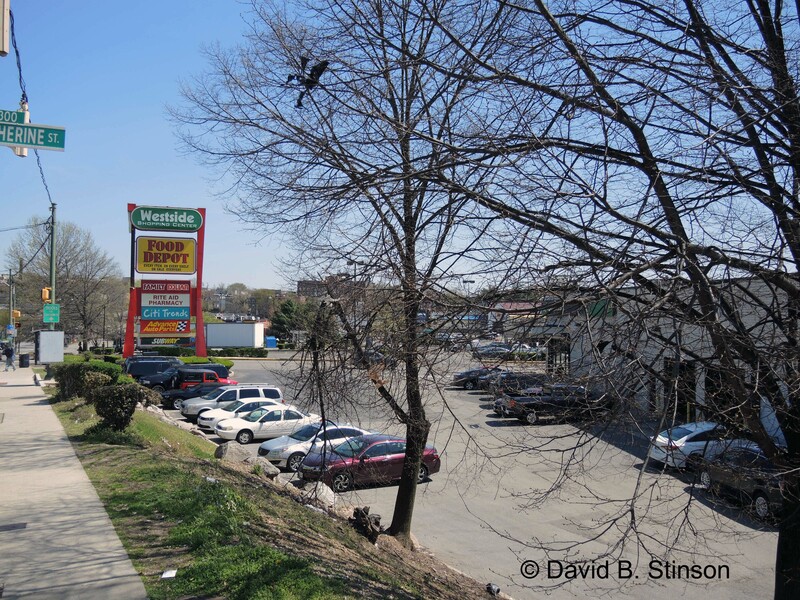 Clare Junction Shopping Center (the land the shopping center is on was once part of the Mount Clare railroad yard). 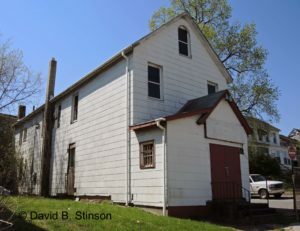 One can imagine young Babe Ruth playing in the back yard of the house and running alongside the garage behind his house. Back yard of 341 South Woodyear Street and Garage (on right) where Babe Ruth’s Father and Uncle Made Lightening Rods. 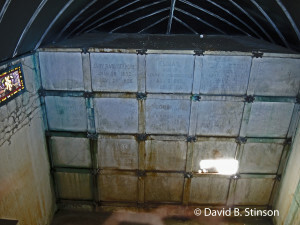 It is remarkable that this structure still stands today, with no marker noting its historical importance. 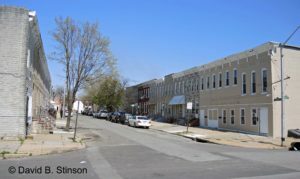 As Ms. Leavy detailed in her book Big Fella, Woodyear Street was a modest working class neighborhood. 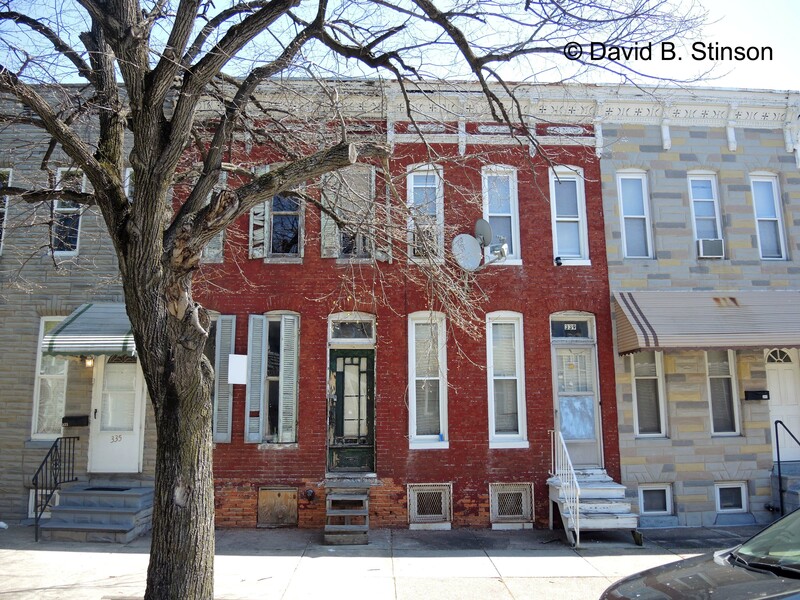 One other relative of Babe Ruth lived on the north side of street at 302 South Woodyear Street. 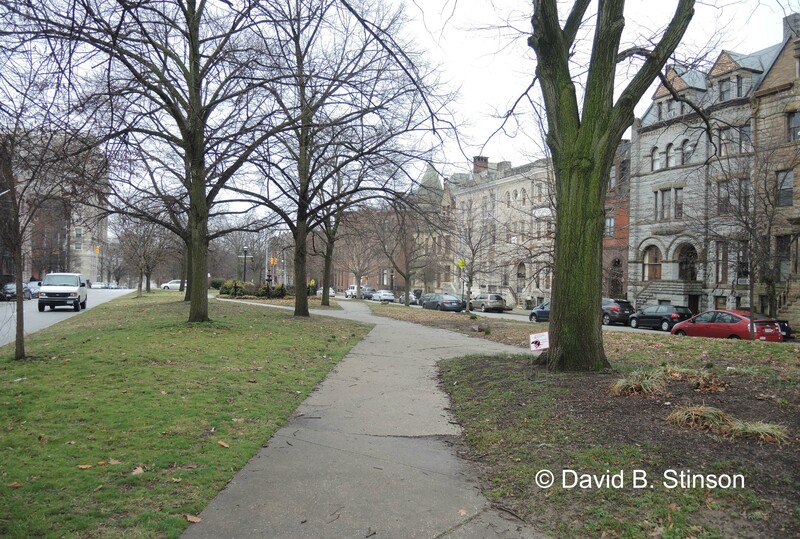 South Woodyear Street is located near Carroll Park, a 117 acre park and the third oldest public park in Baltimore. With access to Carroll Park less than a block from his front door, it is easy to imagine Babe Ruth as a young boy, heading down the street toward the park. 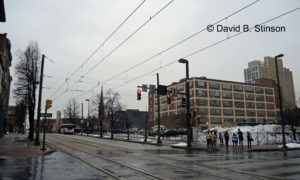 Across Carroll Park, looking south, is downtown Baltimore. 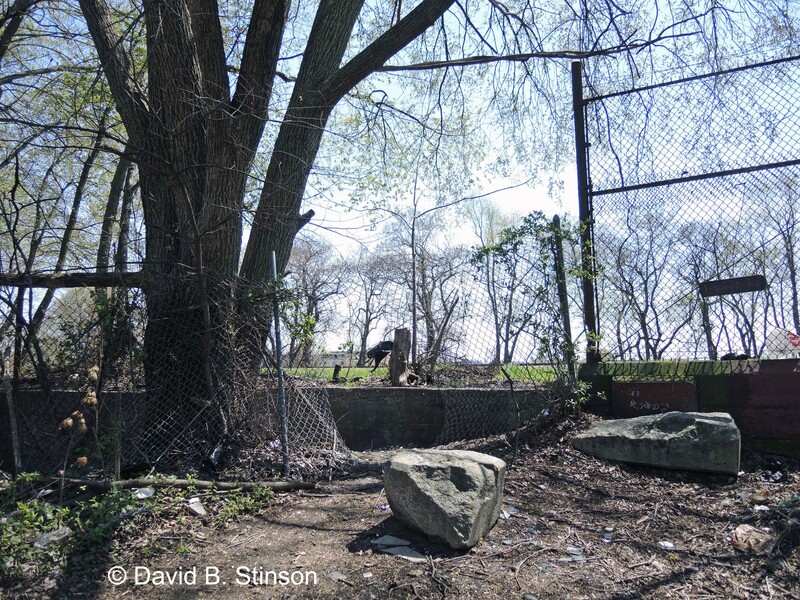 One can imagine a young Babe Ruth playing along the railroad tracks, and in the surrounding parkland. 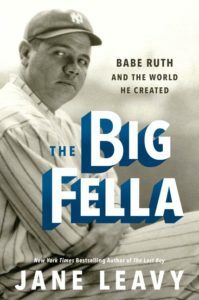 Jane Leavy’s Big Fella is an engrossing read, and Ms. Leavy has done Baltimore proud, shedding much light (both known and previously unknown) on the history of Baltimore and its famous son Babe Ruth. Touring Baltimore with Ms. Leavy in search of Babe Ruth’s past was a true pleasure and I feel fortunate to have been along for the ride. 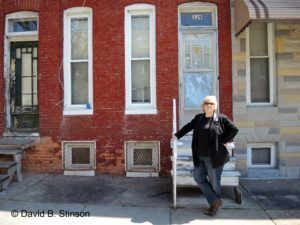 Ms. Leavy will make two appearances in Baltimore during the coming two months, first at Babe Ruth Birthplace and Museum at 3 pm on Saturday, December 15, 2018, and then at Peabody Heights Brewery on Sunday January 20, 2019, during the SABR Baltimore Babe Ruth Chapter meeting. Come out and meet Ms. Leavy at either of these two Baltimore events and pick up a signed copy of Big Fella. This entry is filed under DBS Blog and tagged 300 Block of South Woodyear Street, 3225 Wilkens Avenue, 339 South Woodyear Street, 341 South Woodyear Street, Babe Ruth, Babe Ruth and the World He Created, Babe Ruth History, Baltimore History, Baltimore Lightning Rod Works, Big Fella, Brother Matthias, Cal Ripken Sr. Foundation, Carroll Park, Font Hill Road, Frederick Avenue, George Ruth Sr., Hogs Hair Hill, Jane Leavy, John Ruth, Manufacturers of Steam-Curled Hair and Bristles, Mt. Clare Junction Shopping Center, South Carey Street, St. Agnes Hospital, St. Mary's Industrial School for Boys, Westside Shopping Center, William Wilkens & Company, Xaverian Brothers. 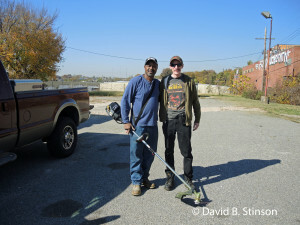 Last month I spent the day with Ken Mars, Baltimore baseball historian, filmmaker, and now author. 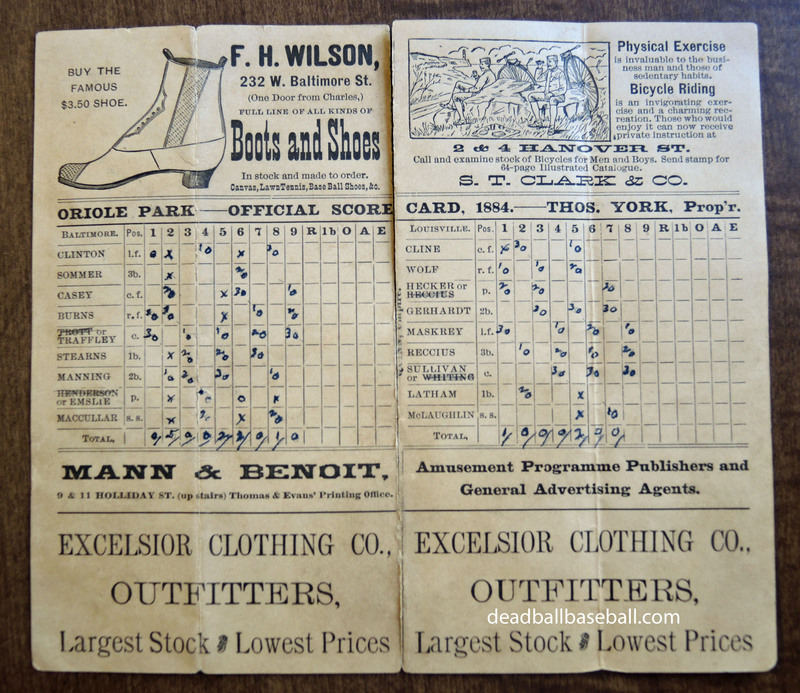 Earlier this year saw the publication of Ken’s first book, Baltimore Baseball: First Pitch to First Pennant. Ken’s wonderful new book takes the reader through the early days of baseball in Baltimore, up to the rise of the National League Orioles, one of the greatest teams of all time. Ken and I share an affinity for Baltimore baseball history. Having read the book, I knew Ken was the person to ask for a lost ballpark tour of Baltimore’s earliest baseball sites. 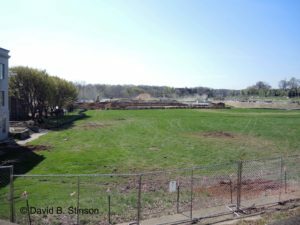 We settled on the former site of Flat Rock Diamond, the first baseball diamond in the State of Maryland, and Madison Avenue Grounds, the first enclosed baseball diamond with a grandstand and the first to charge admission to games. 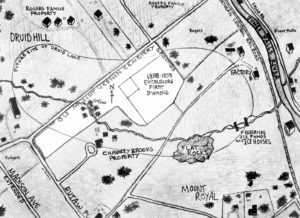 Flat Rock Diamond, home of the Excelsior Base Ball Club, was in existence from 1858 to 1859, and was located in what is now Druid Hill Park in Northwest Baltimore. 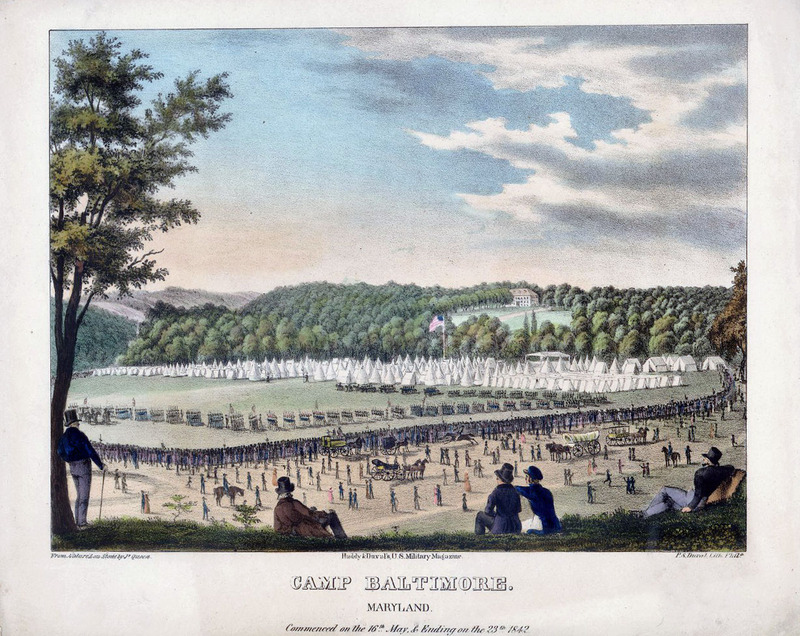 Although there is no known photograph of Flat Rock Diamond, the lithograph below from 1842 depicts the approximate location of what was to become Flat Rock Diamond. 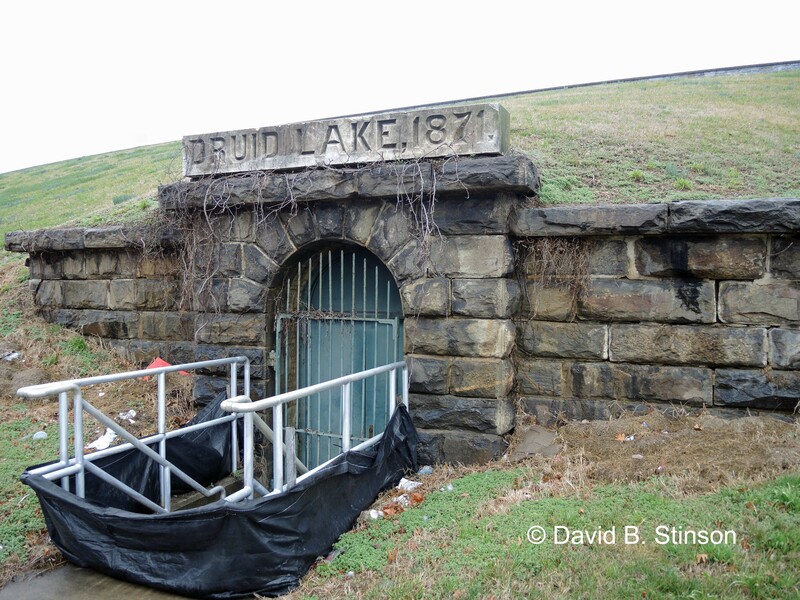 Construction of Druid Hill Park, one of the oldest urban parks in the country, began in 1858 and the park opened in 1860. The opening of Druid Hill Park was the death knell of Flat Rock Diamond, which soon became submerged by a new reservoir for the City of Baltimore and is now a portion of Druid Lake. 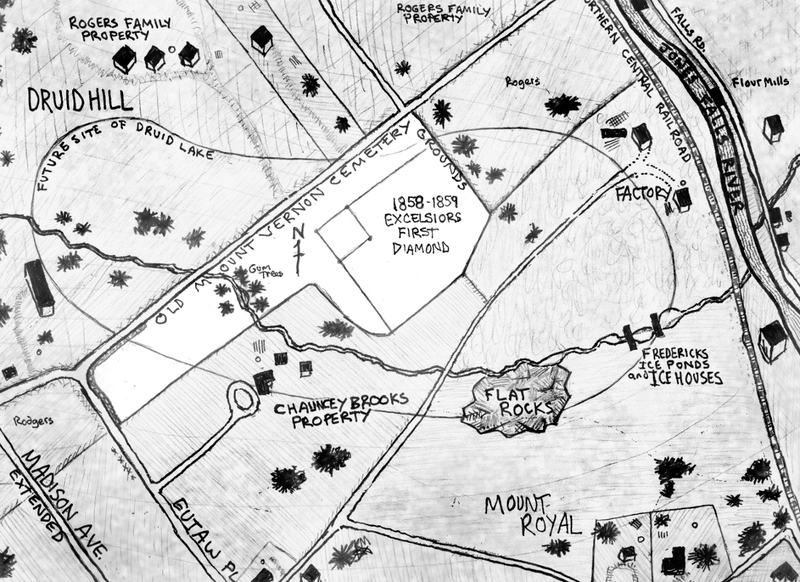 According to Ken’s diagram, the actual ball field site was located in the center of Druid Lake. 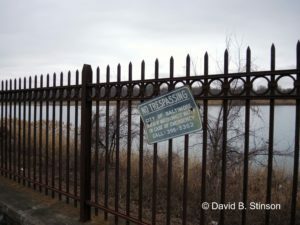 Jones Falls Parkway (I-83) runs along the Eastern most part of Druid Lake, while West 28th Street and Druid Hill Lake Park Drive parallel the southern portion of the lake, as well as the former site of Flat Rock Diamond. 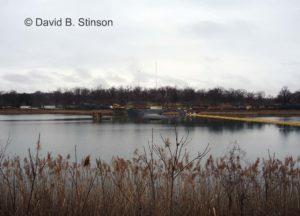 A storm drain in the middle of the lake marks the approximate location of Flat Rock Diamond’s infield. 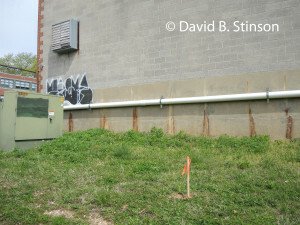 Storm Drain in Middle of Druid Lake Marks Approximate Location of Flat Rock Diamond’s infield. 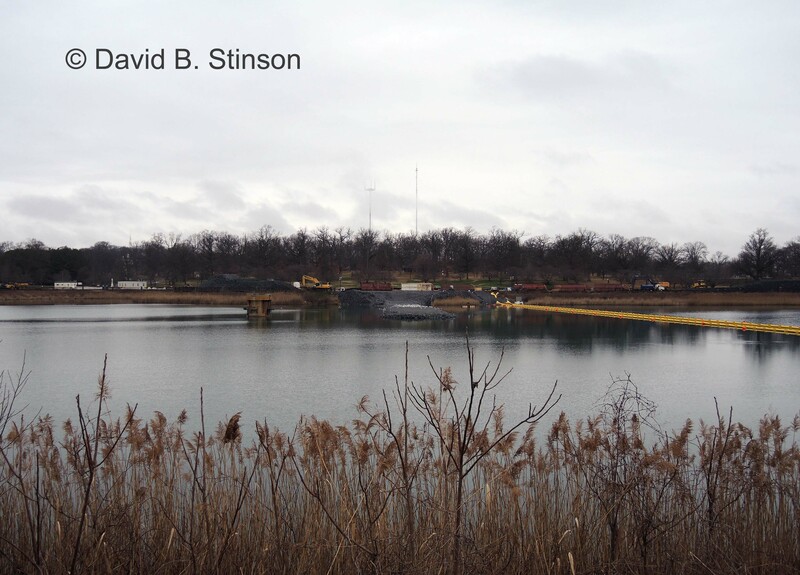 Home plate was located to the left of the storm drain, which , in the photo below, is near the banks of the lake. 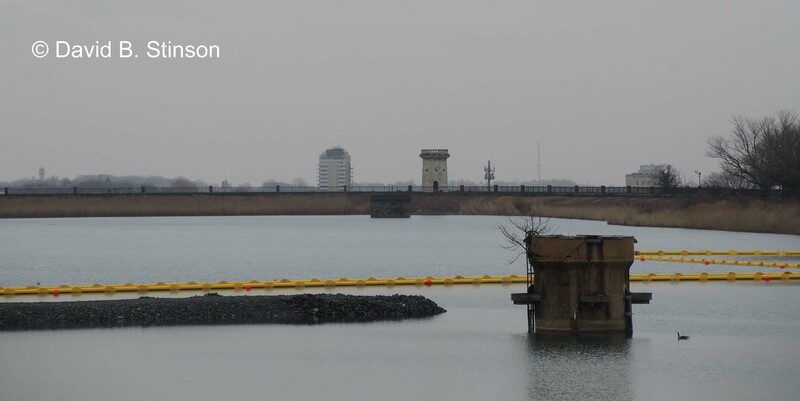 The lake includes reservoir tanks buried beneath the lake, and an earthen damn that surrounds the lake. 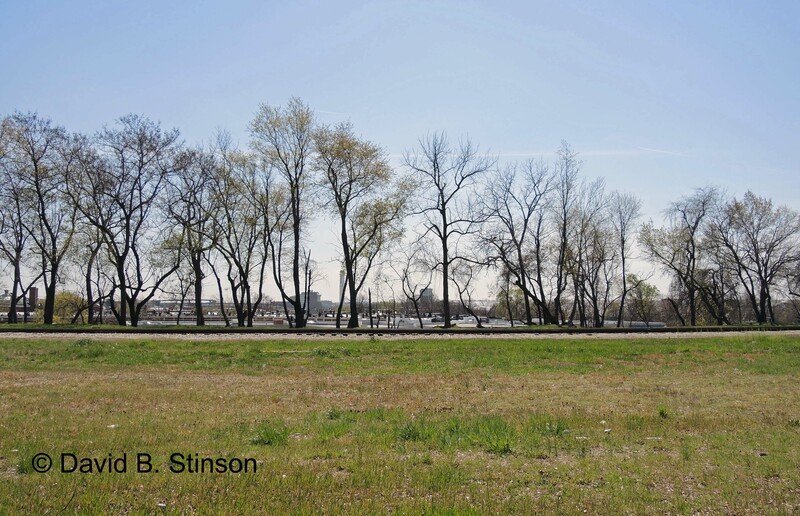 Like Flat Rock Diamond, there is no known photograph of Madison Avenue Grounds, the site of the first intercity game played in Baltimore (the Baltimore Excelsior Base Ball Club vs. the Brooklyn Excelsiors, in September 1860), and the home park of both the Pastimes and the Marylands. Although no photo exits, there is a contemporaneous drawing of the ball park from the 1869 Saschse Bird’s Eye View of Baltimore. 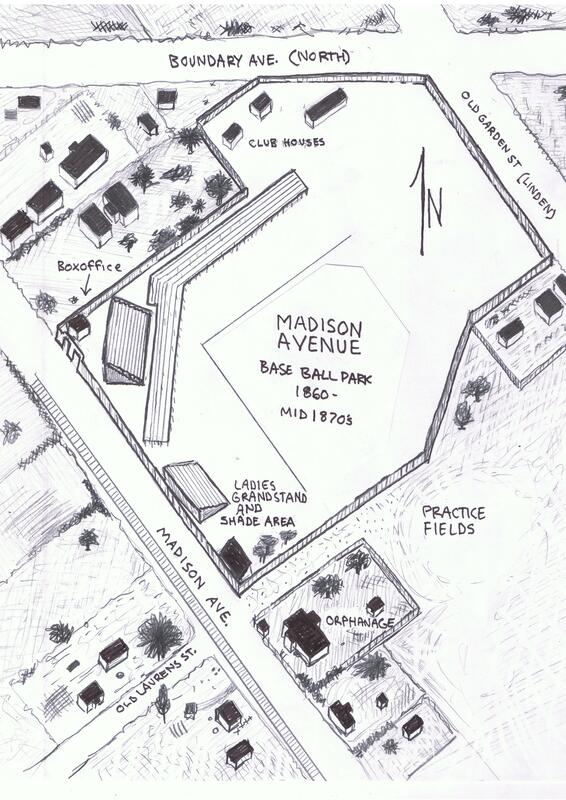 Madison Avenue Grounds was constructed in 1860 and lasted into the 1870s. 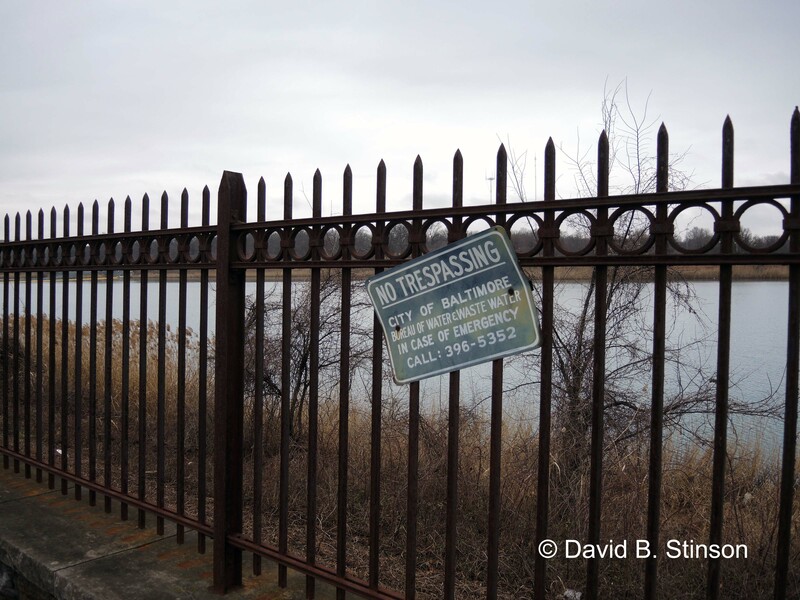 It was located East along Madison Avenue, just one mile south of Druid Lake. 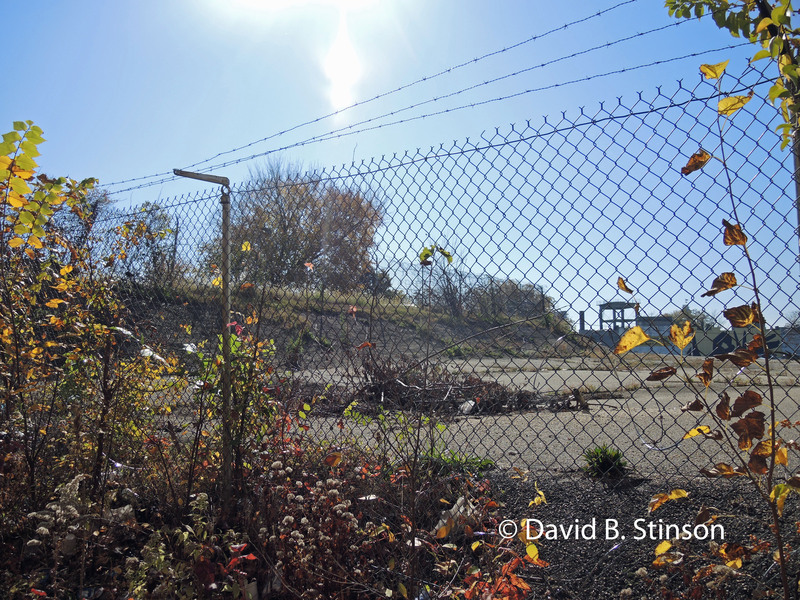 Indeed, Madison Avenue once ran north into Druid Hill Park and terminated at the former site of Flat Rock Diamond. That portion of Madison Avenue is now called Swann Drive. 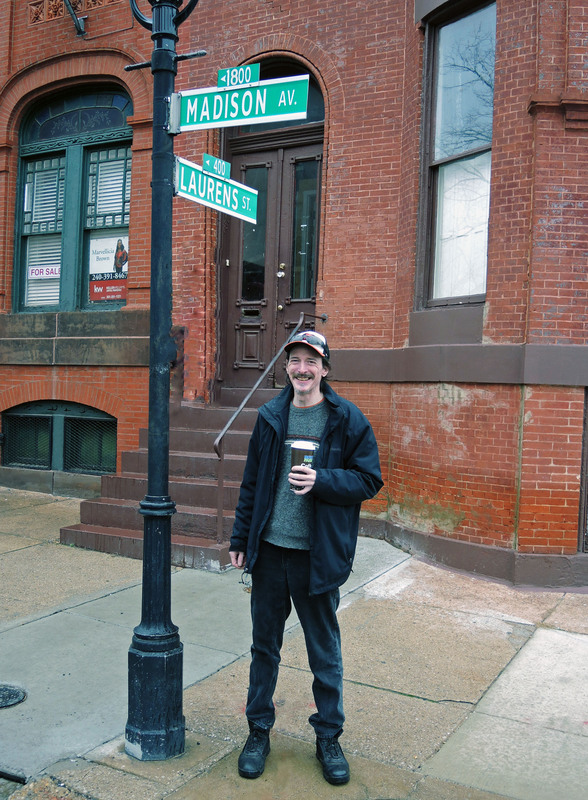 The Southernmost point of Madison Avenue Grounds was located at the intersection of Madison Avenue and Laurens Street. 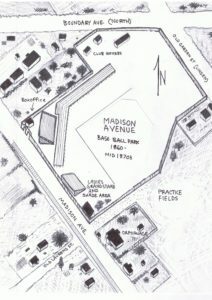 The ballpark ran north and south along the East side of Madison Avenue. 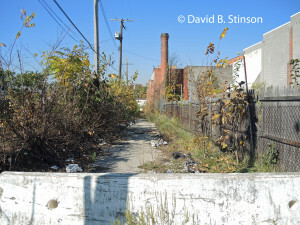 Tiffany Alley runs through the former infield of Madison Avenue Grounds. 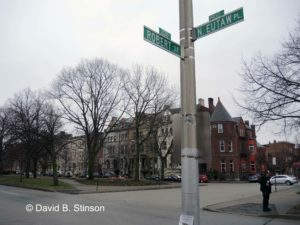 Roberts Street intersects the former site East and West, from the outfield (East) toward home plate (West). 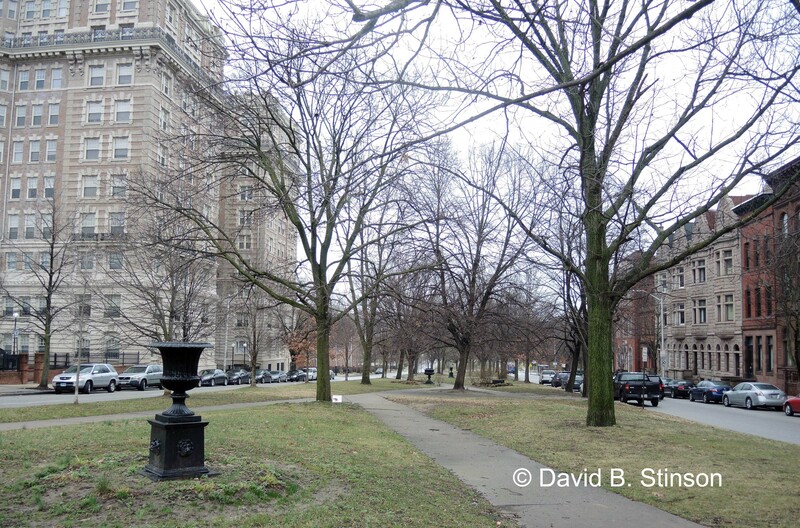 Eutaw Place marks the former site of left and right field. The deepest part of Madison Avenue Grounds’ former center field is now open space at Arnold Sumpter Park. Ken Mar’s new book peeked my interest in seeing first hand the former sites of the many historic baseball parks that existed before the Birds, and the advent of Oriole Parks I through IV. Ken’s knowledge of the history of those ballparks helped bring them back to life and I look forward to tracking down more of the former ballpark sites. “Baltimore Baseball, First Pitch to First Pennant” is an in depth, essential read for any true Baltimore baseball fan. And fear not, this is not a dry read, for Ken Mars knows how to tell a good story well. 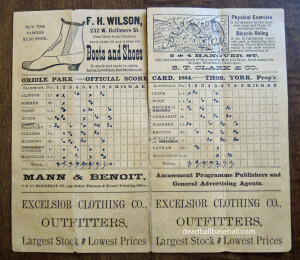 If you would like to purchase a copy directly from Ken, visit him at baltimorebaseballhistory.com. 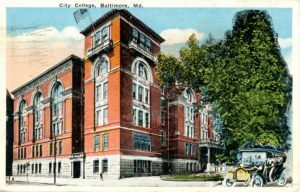 This entry is filed under DBS Blog and tagged Baltimore baseball history, Baltimore Baseball: First Pitch to First Pennant, Druid Hill Park, Druid Lake, Eutaw Place, Excelsior Base Ball Club, Flat Rock Diamond, Ken Mars, Lost Ballparks, Madison Avenue Grounds, the Marylands, the Pastimes. 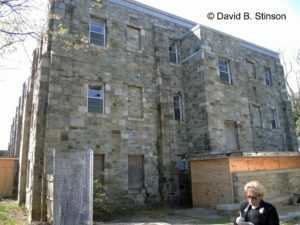 Near the southeast corner of Wilkins Avenue and Caton Avenue in Baltimore, Maryland, is a four story stone building that once housed St. Mary’s Industrial School for Boys and, later, Cardinal Gibbons High School. 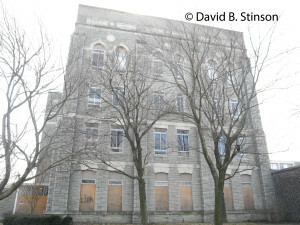 There seems to be a general assumption that this building dates to the time that Babe Ruth attended St. Mary’s Industrial School for Boys (1902 – 1914) because it’s architecture is similar to buildings that once comprised the St. Mary’s Industrial School complex, but were destroyed by a fire at the school in 1919. 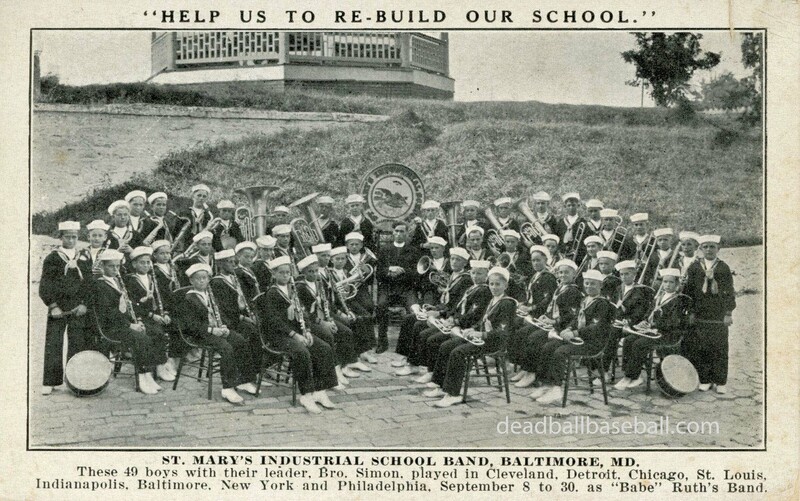 Below is an Xaverian Brothers’ photograph of St. Mary’s Industrial School, circa 1911, as it looked at the time Babe Ruth was a “student” there. 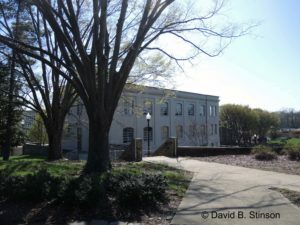 The main administrative building complex, which included both dormitories and classrooms, fronted Wilkins Avenue. 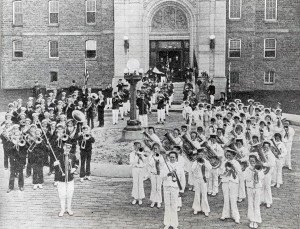 The St. Mary’s Industrial School Chapel, constructed in 1911, was located at the corner of Wilkins Avenue and Caton Avenue, and can be seen to the right of the photo as well. 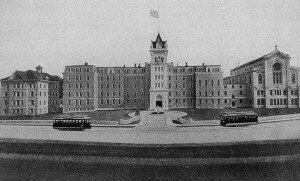 The separate dormitory and classroom building, which can be seen to the left of the photo, was constructed in 1909. 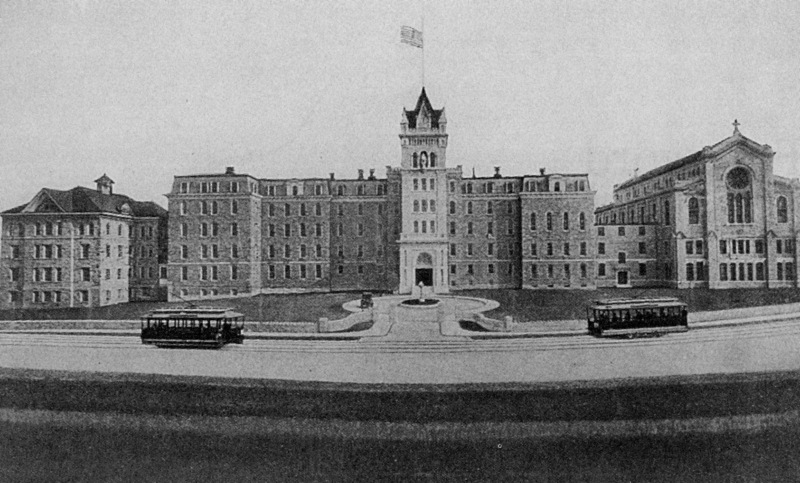 The main entrance to the complex included a six-story tower with a circular drive in front of the tower that was accessible from Wilkins Avenue. 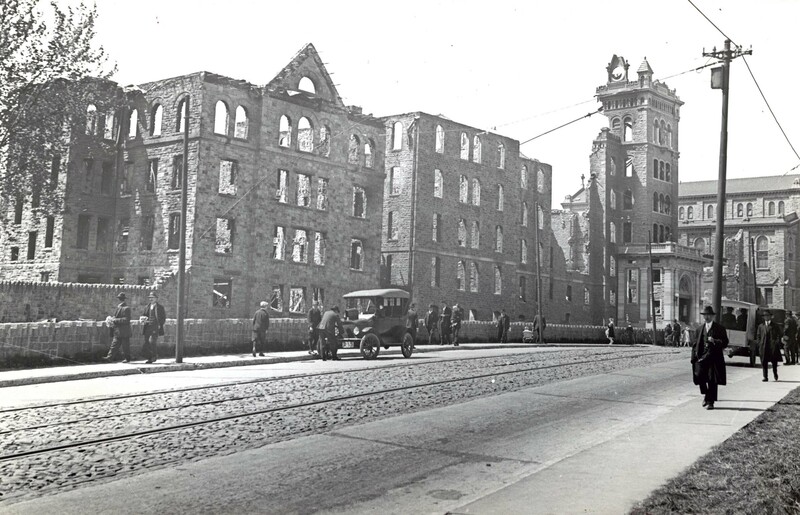 The 1919 fire destroyed the main administrative building complex that fronted Wilkins Avenue, including the dormitory that was completed just ten years earlier. 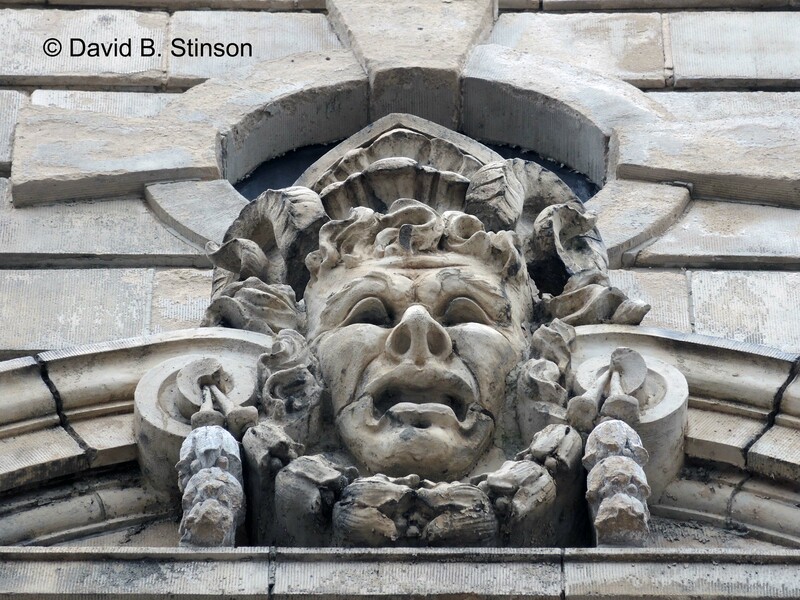 Although the stone walls of the dormitory and the building to the left of the front entrance appear to be somewhat intact even after the fire, it appears that the stone walls of the buildings located just to the right of the front entrance sustained considerably more damage. The chapel, which can be seen in the photo as well, sustained only smoke and water damage. St. Mary’s Industrial School Looking Southeast Down Wilkins Avenue, After The 1919 Fire (Photo by Hildegarde Anderson of 3236 Ravenswood Avenue, Baltimore Sun Reprint of Hildegarde photo, 1962). Soon after the fire, an effort was underway to rebuild the school. 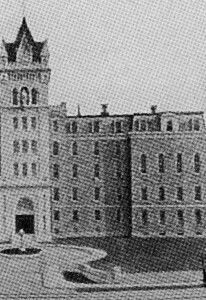 By 1923, the Xaverian Brothers had completed construction of the four story stone building which remains at the site today. The four story building was constructed just east of the chapel. 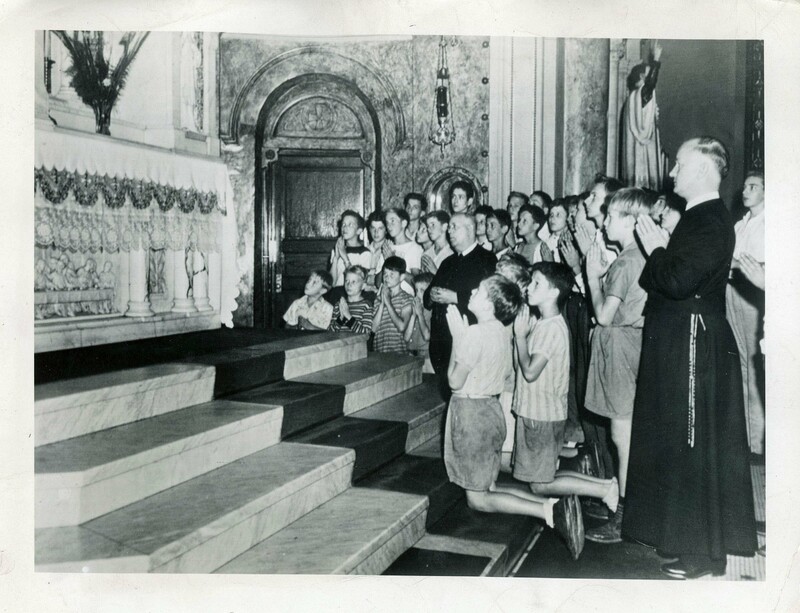 However, the chapel is no longer at the site, having been demolished in 1961 to make way for construction of Cardinal Gibbons High School. 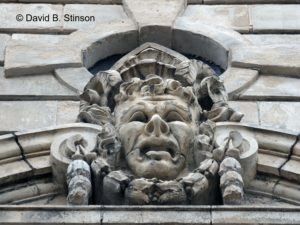 So the question is, whether the four story stone building currently at the site was brand new as of 1923, or whether it predates the fire and was a renovation of a portion of the main administrative building complex not destroyed by the fire. 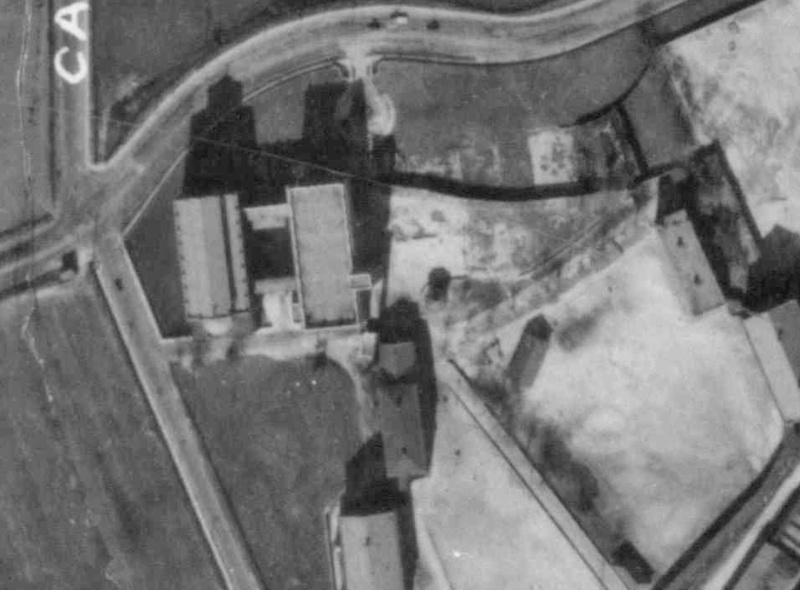 The answer to this mystery lies partially in the above 1927 aerial photo of the St. Mary’s Industrial School grounds, which shows the placement and location of the chapel and the four story stone building eight years after the fire. 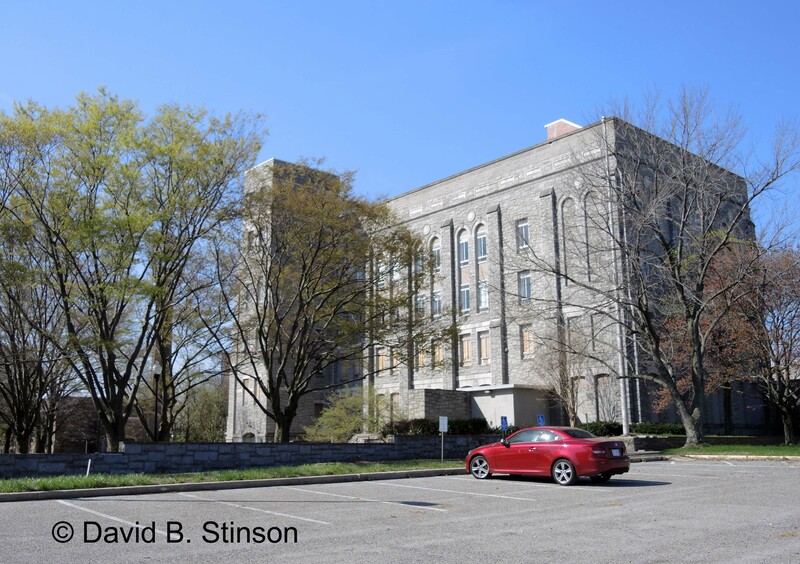 Both buildings front Wilkins Avenue (which runs east and west) and the chapel is located at the southeast corner of Wilkins Avenue and Caton Avenue (which runs north and south). Indeed, the chapel’s steeple can be seen in the shadow it casts over Wilkins Avenue. Given the placement of the circular drive (which is visible in the photo as well), the four story stone building at the site today sits just to the west of what would have been the front entrance of the original building complex. 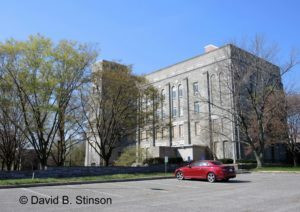 However, the front facade of the four story stone building at the site today – with its six columns of windows – does not match the facade of the building(s) that sat just to the west of the front entrance prior to the fire – each of which had four columns of windows. 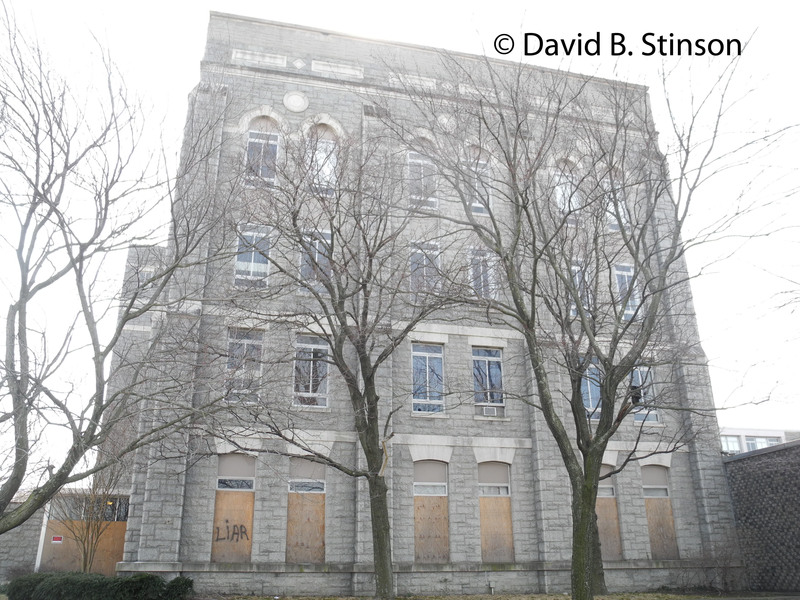 Moreover, even assuming that the four story stone building at the site today predated the 1919 fire and somehow had survived the fire, that building would be evident in photo of the school taken just after the fire. Indeed, the building would have blocked the side view of the chapel in the photo below. 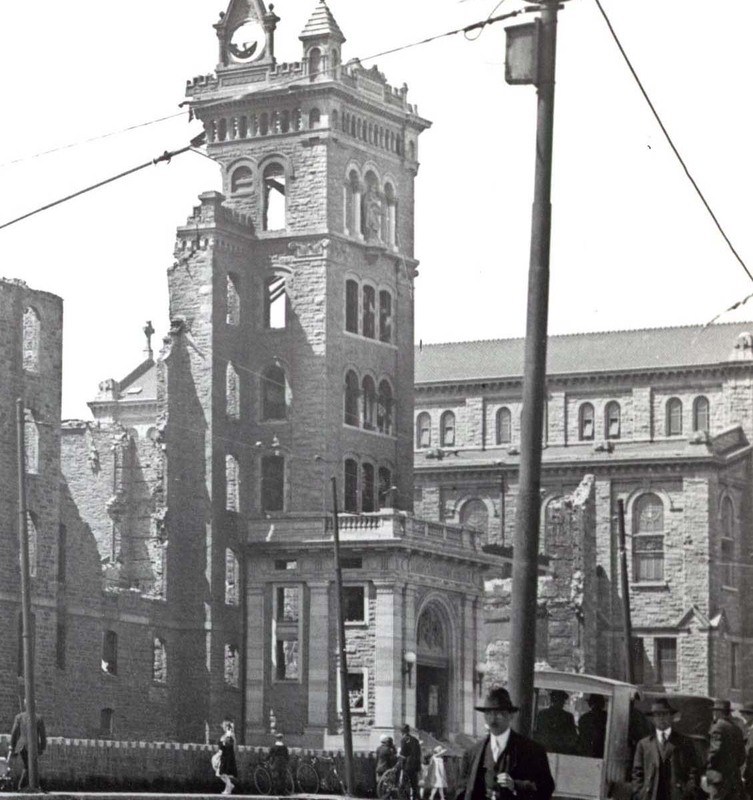 However, the side view of the chapel – from front to back – is clearly visible in the 1919 photo of the fire damage. Detail of Photo Taken After The Fire (Photo by Hildegarde Anderson of 3236 Ravenswood Avenue, Baltimore Sun Reprint of Hildegarde photo, 1962). 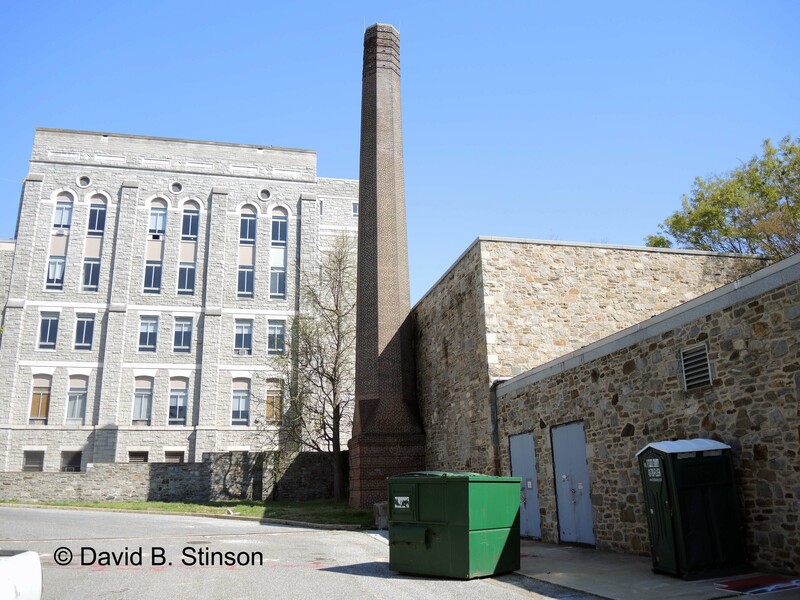 Thus, it would appear that the four story stone building at the former site of St. Mary’s Industrial School today was new construction in 1923, and not a renovation of a building that was at the site during the time Babe Ruth attended the school. However, I am open to anyone who has any information that might shed additional light on this issue, or flat out knows the answer. If you do, just submit a comment! In February 1914, George Herman “Babe” Ruth signed his first professional baseball contract in the office of Brother Paul Scanlon, the Superintendent of St. Mary’s Industrial School for Boys. Babe Ruth’s parents had signed their son over to the Xaverian Brothers when he was eight years old and Brother Paul, as superintendent of the school and Ruth’s legal guardian, was required to sign the player contract on his behalf. 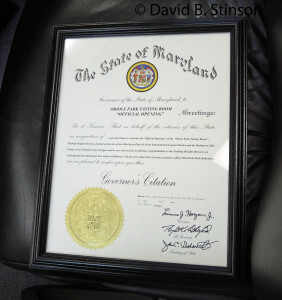 Present at the signing that day, in addition to Ruth and Brother Paul, were Jack Dunn, owner of the International League Baltimore Orioles, and Brother Gilbert, the Athletic Director at nearby Mount St. Joseph’s (High School) College (he was a friend of Dunn’s). 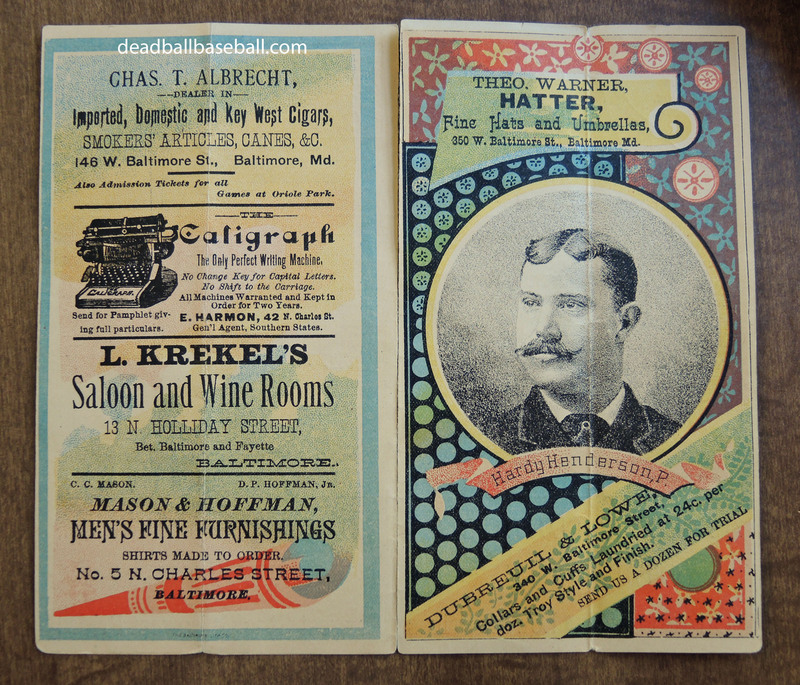 Prior to that meeting, Dunn and Brother Gilbert had introduced Dunn to Brother Matthias Boutlier (or Boutelier), who was instrumental in helping Ruth develop his baseball skills. Ruth’s contract set his salary at $600 for the season. The Baltimore Sun reported the signing on February 15, 1914:”[t]he Oriole magnate signed another local player yesterday. The new Bird is George H. Ruth, a pitcher, who played with teams out the Frederick road. Ruth is six feet tall and fanned 22 men in an amateur game last season. He is regarded as a very hard hitter, so Dunn will try him out down South.” On March 2, 1914, prior to Ruth’s departure for Fayetteville, North Carolina, where Dunn’s Orioles held spring training, Brother Paul took Ruth on a tear-filled tour of St. Mary’s so that Ruth could say goodbye to his friends at the school. 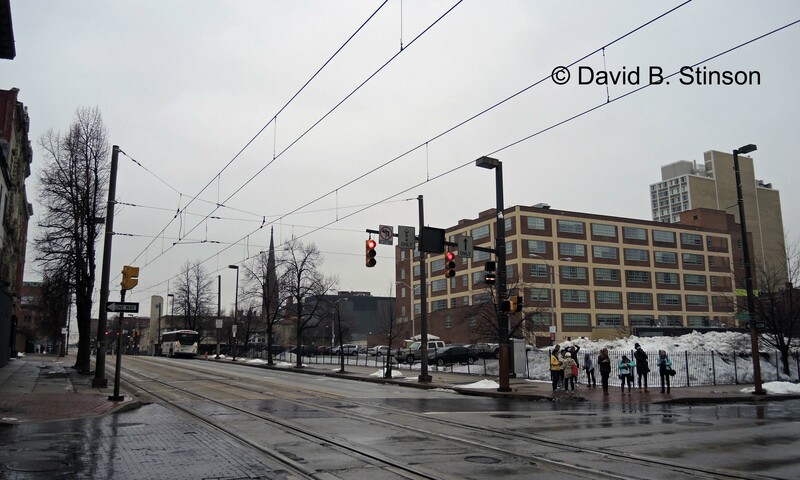 Brother Paul then accompanied Ruth to Union Station in Baltimore, where he departed for North Carolina, on what was the first of Ruth’s many train rides. 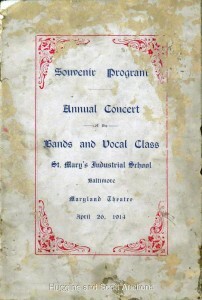 Although Ruth later would become the most famous export of St. Mary’s Industrial School, at the time of his departure, it was the St. Mary’s Bands that perhaps had brought the school the most fame in Baltimore and around the country (John Phillips Sousa is said to have stated that St. Mary’s was the best high school band he had ever heard). On April 24, 1914, just a month and a half after Ruth departed the school, St. Mary’s held its Annual Concert. 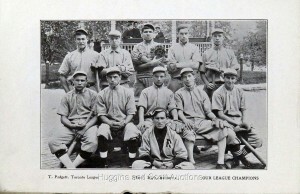 Included in the school program was a now-famous photo of Ruth and his teammates, who in 1914 were league champions (according to the photo). The photo depicts the team grouped in front of the school’s bandstand or gazebo. 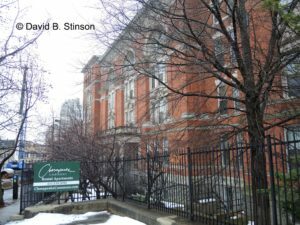 Exactly five years to the day after that concert was performed, a fire started by a errant piece of coal destroyed most of the buildings at St. Mary’s. 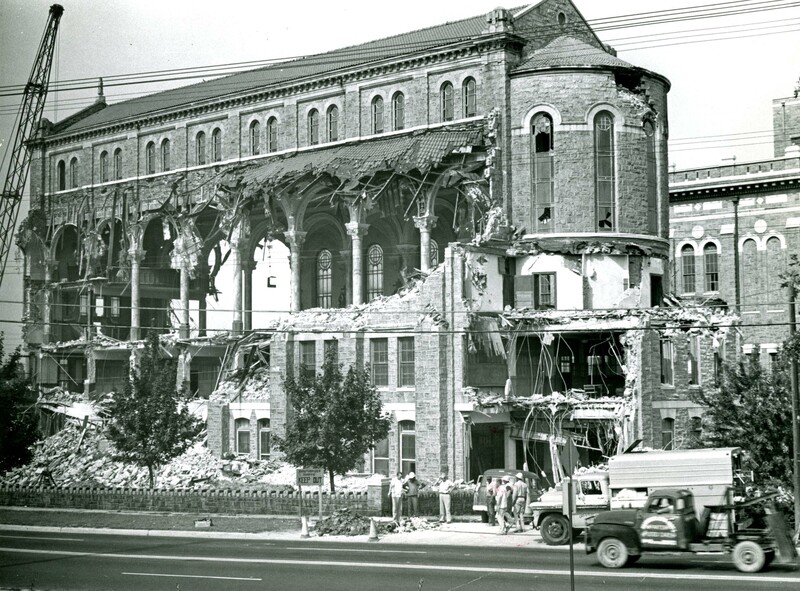 The fire destroyed the main school building, although the chapel that sat at the corner of South Caton Avenue and Wilkins Avenue was spared. 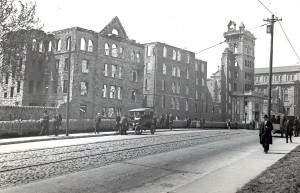 St. Mary’s Industrial School in 1919, After the Fire (Photo by Hildegarde Anderson of 3236 Ravenswood Avenue, Baltimore Sun Reprint of Hildegarde photo, 1962). At the time of the devastating fire, Ruth was a member of the New York Yankees and well on his way to becoming a baseball legend. 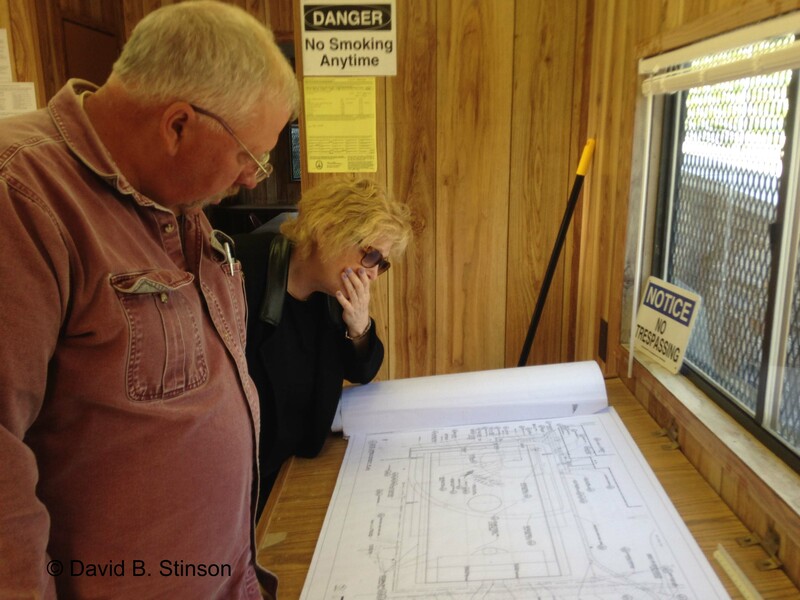 When Ruth learned of the fire he was determined to find a way to rebuild the school. Although it is not clear who’s idea it was, Ruth helped the school raise money through a tour by the St. Mary’s Industrial School Band. Brother John Sterne, who as an adolescent attended St. Mary’s, played in the band on that tour and years later recounted the event: “[d]uring the last road trip of the 1920 season, Babe sponsored the St. Mary’s Band to travel with the Yankees as ‘Babe Ruth’s Boys Band.’ Giving concerts at the ball parks before the game, the boys would later circulate among the patrons, collecting change and bills in their sailor hats. Not only was a goodly sum of cash received, but the free publicity was invaluable. By this effort, the Babe gave much back to his alma mater, of which he was always proud.” Cairnes, Phillip F. (Brother Gilbert), Young Babe Ruth, His Early Life and Baseball Career, From the Memoirs Of A Xaverian Brother, McFarland 1999, p. 11. Brother Paul, who was school superintendent at the time of the fire, accompanied the St. Mary’s Band on that trip. 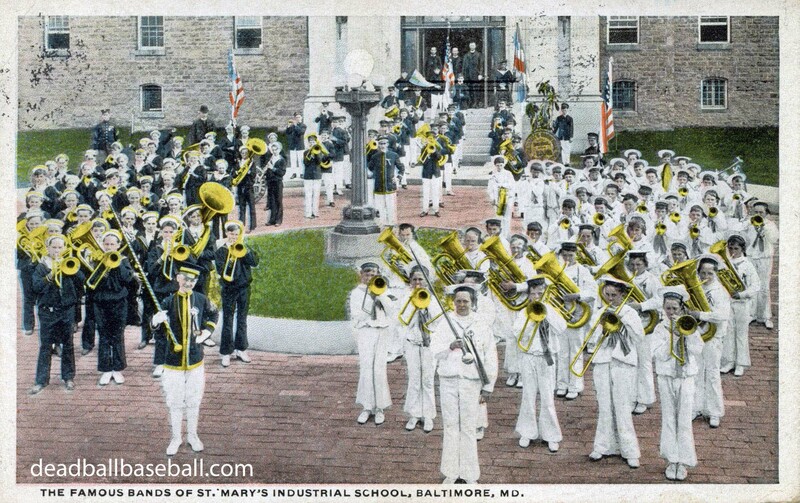 As part of St. Mary’s efforts to raise funds, the school produced a Private Mailing Card that pictures the St. Mary’s Band near the baseball field where Ruth once played. 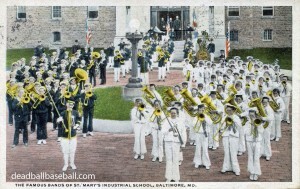 The bandstand, where Ruth posed for the 1914 team photo, is visible in the background of the card as well. 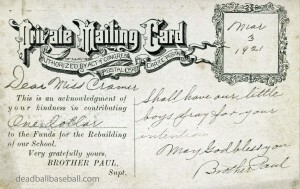 The reverse of the Private Mailing Card includes a printed acknowledgement from Brother Paul, thanking patrons for contributing funds for rebuilding the school. 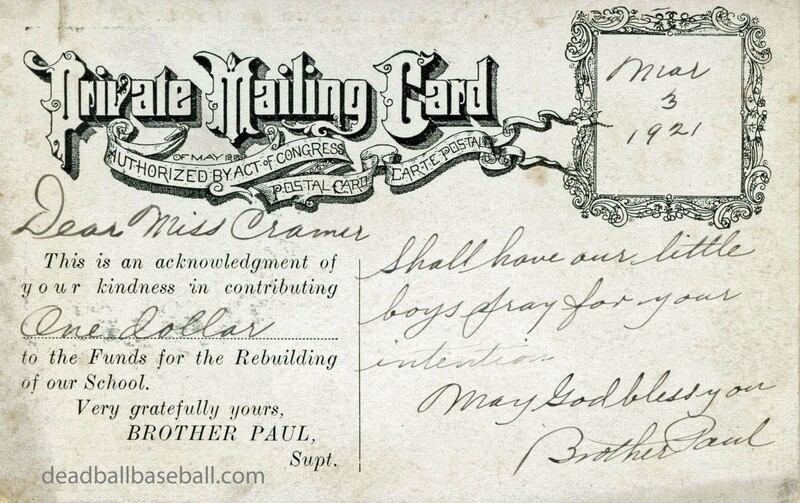 One example of that card, which is pictured above, has a personal note from Brother Paul dated March 3, 1921, thanking “Miss Cramer” for a one dollar donation. 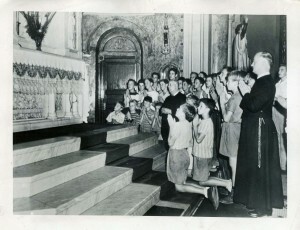 Brother Paul adds, “Shall have our little boys pray for your intention. May God bless you.” Brother Paul remained at St. Mary’s until 1925, and three years later was named Superior General of the Xaverian order. 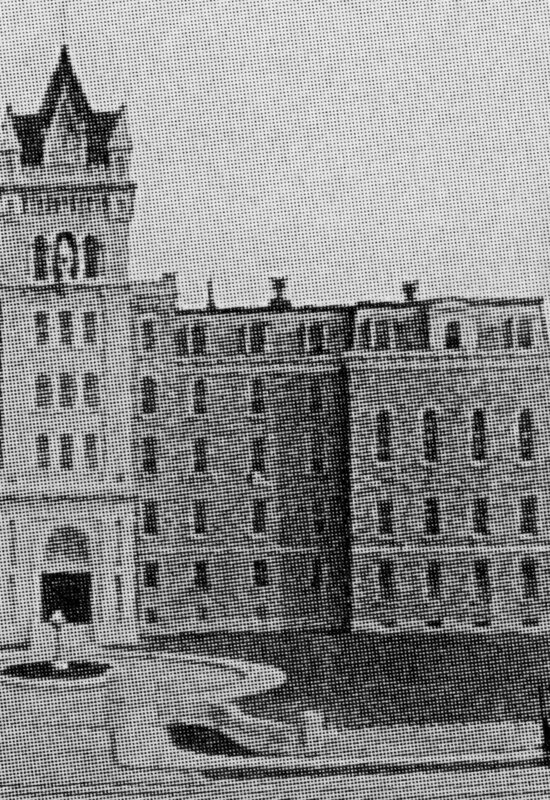 St. Mary’s Industrial School closed in 1950, and the facility later was reopened as Cardinal Gibbons High School (as an aside, it was Cardinal Gibbons who performed Ruth’s Sacrament of Confirmation at St. Mary’s in 1907). Cardinal Gibbons High School closed in 2010. 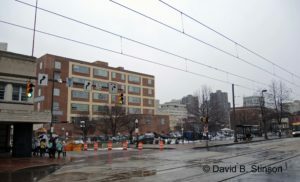 The property is now being redeveloped by St. Agnes Hospital. 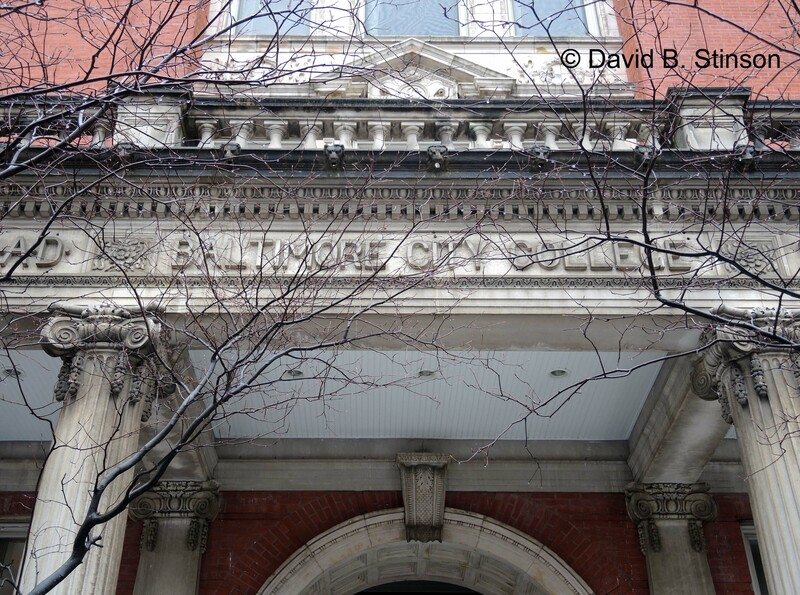 It is perhaps fitting that, once Babe Ruth died, the school that helped make him who he was, was shuttered as well. Newspaper accounts do not mention whether Babe Ruth’s Band played one last time in his honor the day he passed. 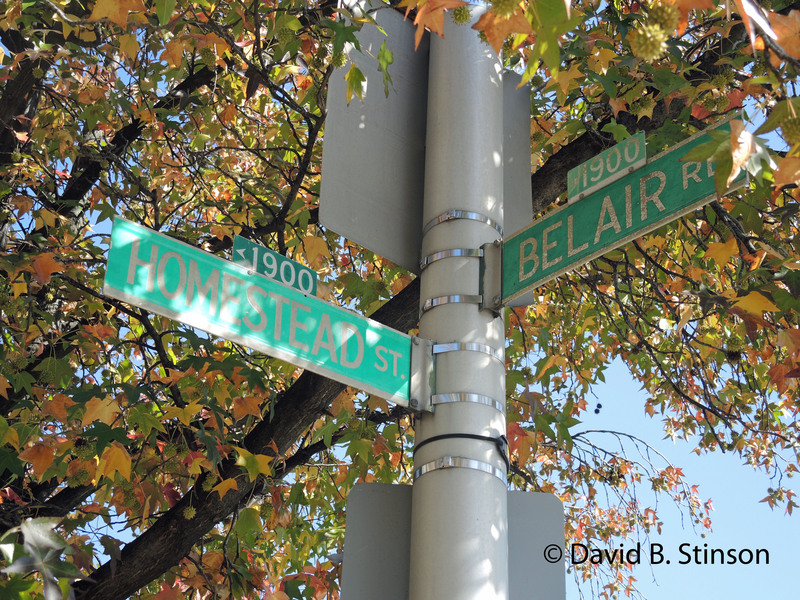 The hardscrabble intersection of Belair Road and North Avenue in Baltimore, Maryland, has no marker noting the importance of the area to the history of Baltimore baseball, or to the history of Baltimore beer, for that matter. 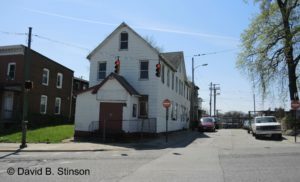 However, Eagle Brewery and Malt House, which once stood in the northwest quadrant of that intersection, has deep baseball roots. Built on the former site of Richardson’s Oil Cloth Mill, the brewery was started by John Henry Von Der Horst in 1866 as part of the J. H. Von Der Horst Brewing Company. 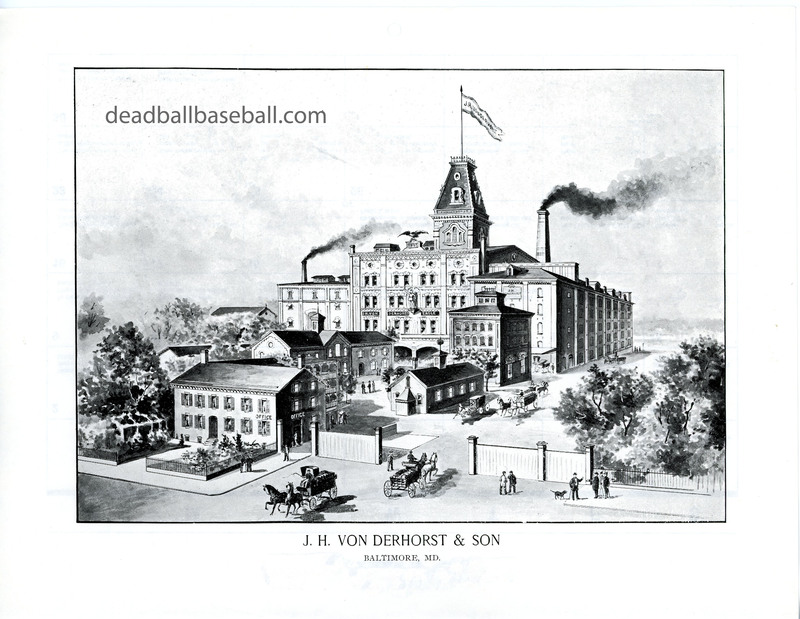 In 1880, John Von Der Horst gave his son, Henry R. “Harry” Von Der Horst, an interest in the brewery and renamed the company J. H. Von Der Horst & Son Brewing Company. 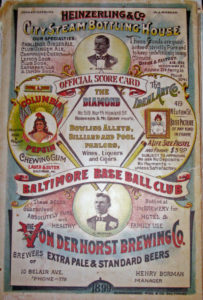 With profits from the Eagle Brewery, Harry Von Der Horst in the early 1880s purchased a franchise in the American Association, a new major league hoping to rival the National League. Unlike the National League, however, the American Association permitted its franchises to sell beer at their home games. Harry Von Der Horst installed a beer garden in his ballpark and encouraged fans to remain even after the game had ended to consume more beer. Although the American Association Orioles (they were the first professional Baltimore baseball team known as the Orioles) never placed higher than third during their decade in existence, the sale of beer at the games proved quite profitable. 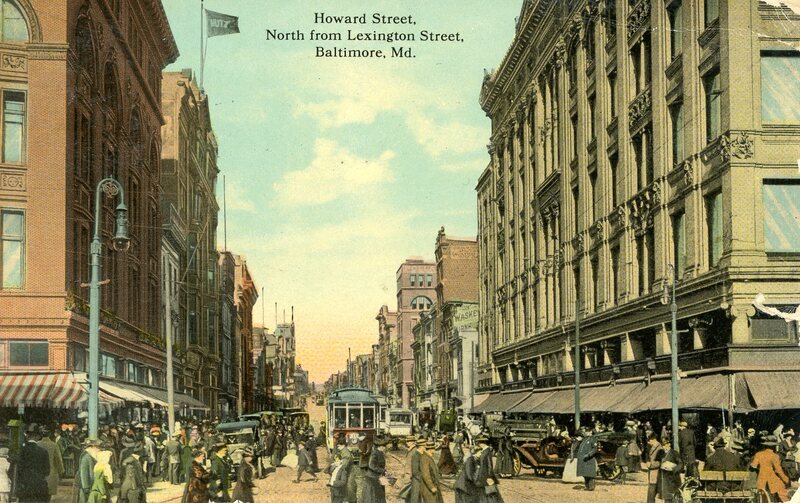 In 1892, with the demise of the American Association, Harry Von Der Horst’s Orioles entered the newly-expanded National League, and just two years later, in 1894, brought Baltimore its first ever professional baseball championship. 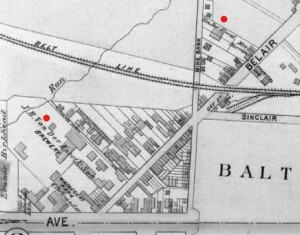 Eagle Brewery and Malt House was bounded by Belair Road and Vonderhorst Lane (now Homestead Street) to the East, Sinclair Street to the North, Patterson Park Avenue to the west, and North Avenue to the South. 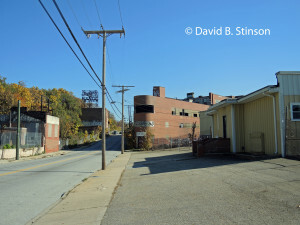 By the 1880s, Eagle Brewery was one of the largest in the city. 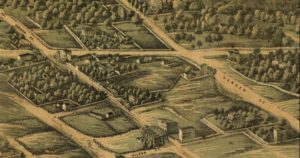 According to the book Baltimore: Its Past and Present, A Souvenir Of The 27th Convention of the United States Brewer’s Association (A. 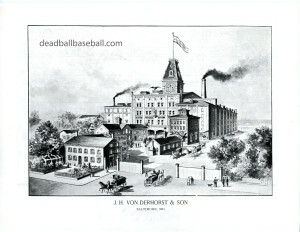 Von Degen, 1887), the main brewery building was erected in 1880, was five stories high, and included three large steel boilers. 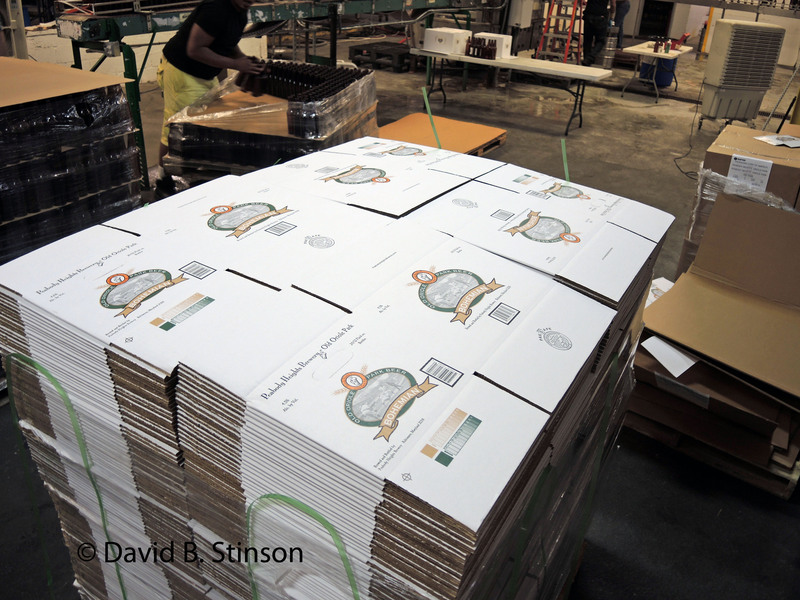 Eagle Brewery also had its own six-story malt house which produced 100,000 bushels of malt each year, and a five story ice house which provided refrigeration through the use of two DeLaVergne steam-driven ammonia compressors. The brewery’s annual production was 40,000 barrels. 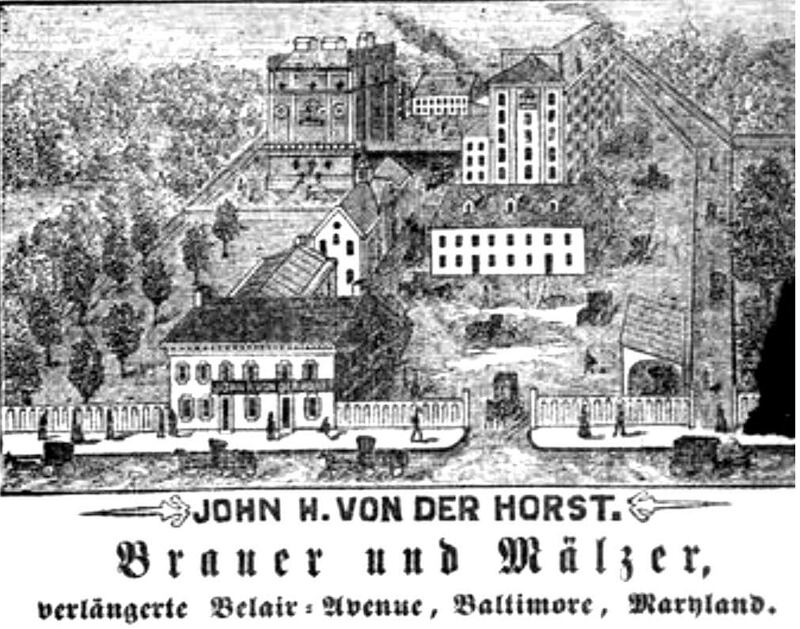 The two drawings above depicts the brewery as it looked fronting Belair Road, just south of what is now Homestead Street (formerly Vonderhorst Lane). 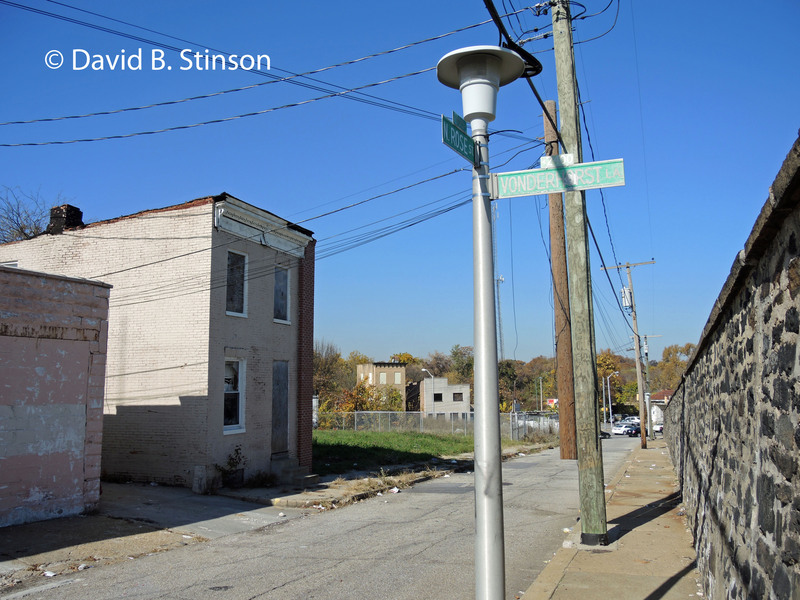 The picture below shows that plot of land as it appears today, at the intersection of Belair Road and Homestead Street. 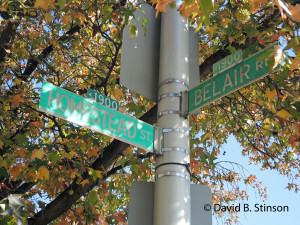 The street address is 1920 Belair Road (formerly 10 Belair Avenue Extended). 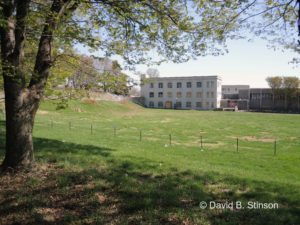 There are no buildings from the Von Der Horst brewery at the site today. 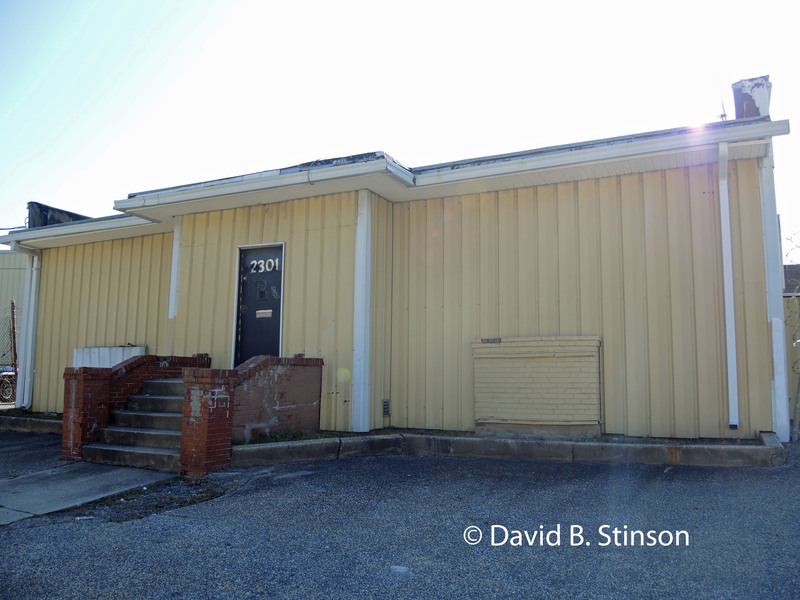 A portable building located at the former entrance to the brewery on Belair Street is owned by Power House World Ministries, which also owns several other buildings across from the site on Belair Road. 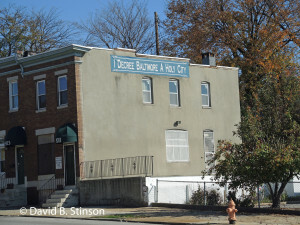 Power House World Ministries Building on Belair Road, Baltimore, Maryland, Across the street from the former site of Eagle Brewery. Bishop James A. Winslow, Jr. and Baseball Historian Ken Mars. 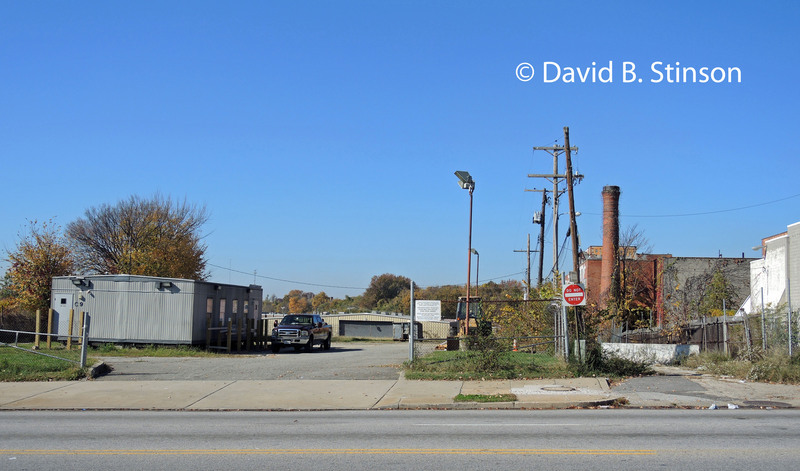 Behind the former entrance to the brewery on Belair Road is the Allender Bus Company, located at 2301 Sinclair Lane. 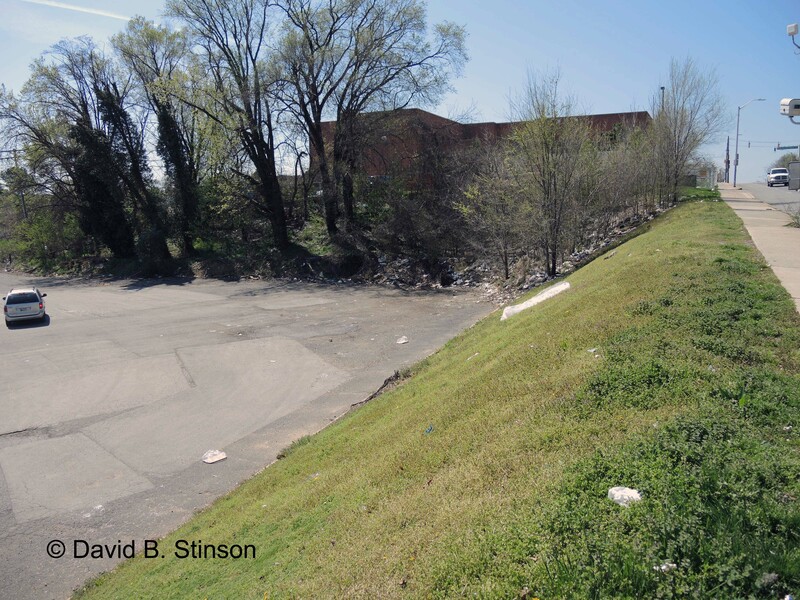 The Allender Bus Company sits on the portion of the property that once included the five story brewery building and the six story malt house. 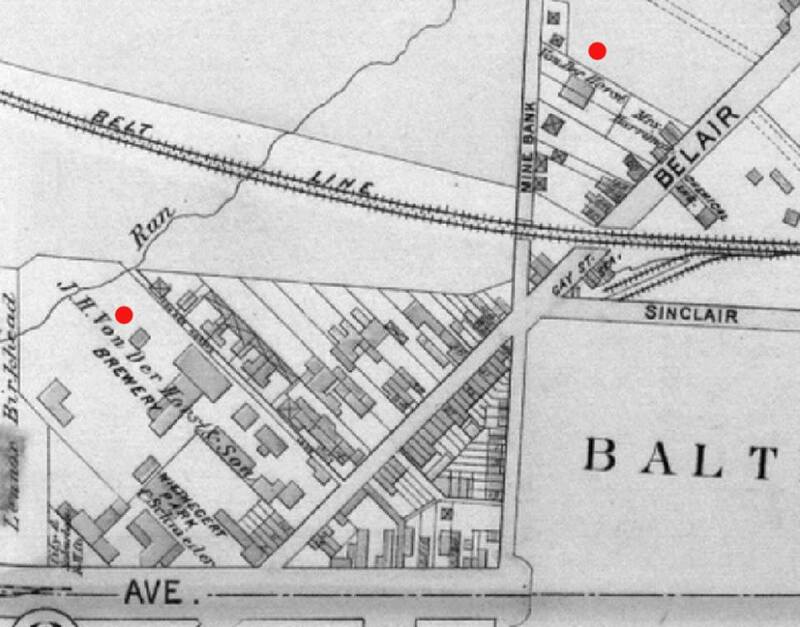 The tract of land that fronts Belair Road sits at a higher elevation than the tract where Allender Bus Company is located. 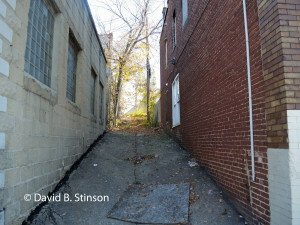 At about this spot once sat the five-story ice house, which had deep vaults located several stories below ground. 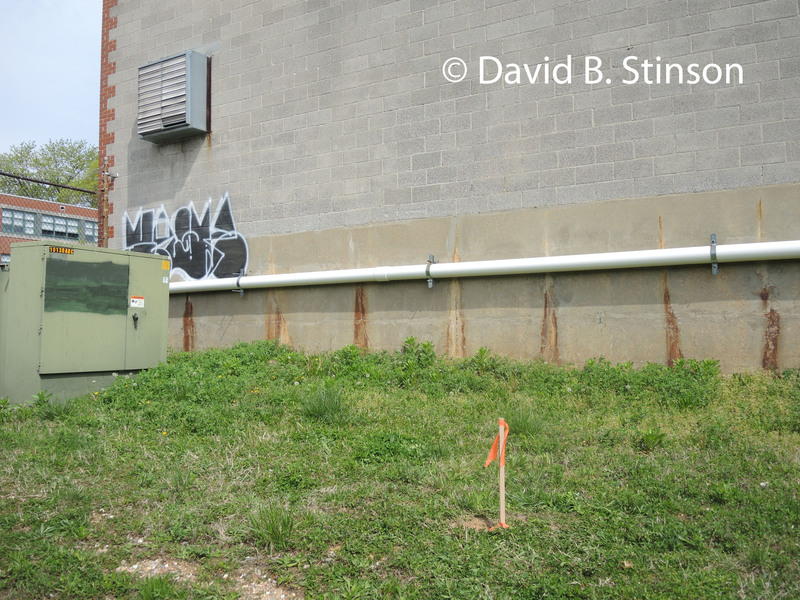 One can only wonder what an excavation of this area might reveal. 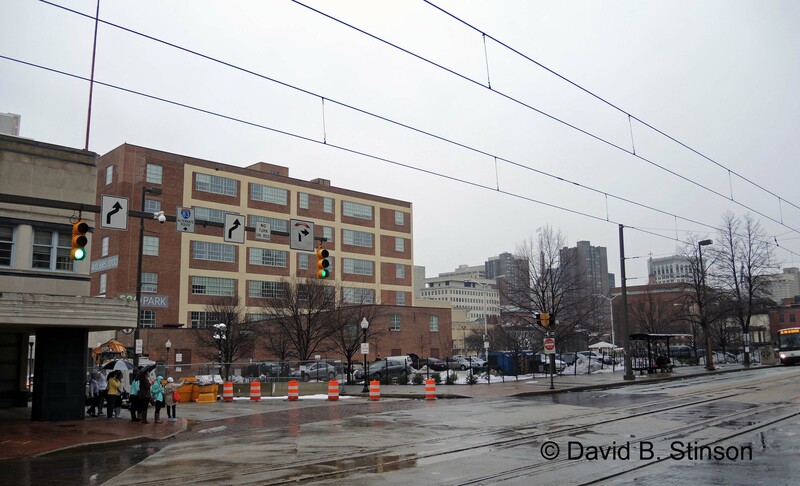 Running parallel to Homestead Street is the former Goetze Meat Plant. 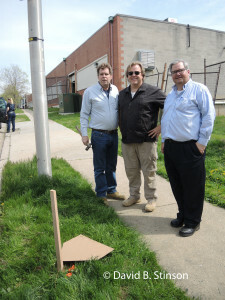 A Baltimore landmark that remains to this day is the large, metal Goetze sign that sits along Sinclair Lane, just south of the railroad tracks. Homestead Street today is really nothing more than an alley, now closed off and impervious to vehicular traffic. 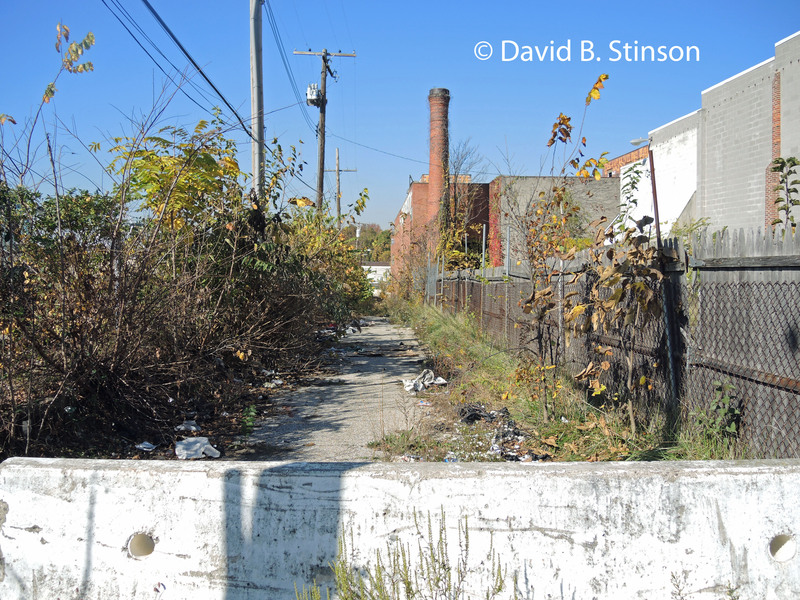 In 1929, during the height of prohibition, the Baltimore City Council voted to change the name of the street from Vonderhorst Lane to Homestead Lane because local residents did not like the road, or the surrounding area, being linked to the former brewery. However, perhaps as a homage to the former landmark, the city changed only a portion of the street and left a one block stretch of Vonderhorst Lane east of Belair Road on the map and at the site. 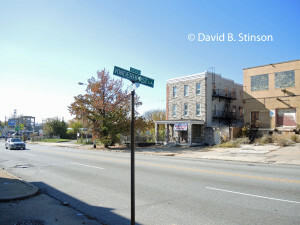 Across the street from the former brewery on Belair Road is a sign for Vonderhorst Lane, which marks a right of way which now is nothing more than an alley. The eastern end of Vonderhorst Lane terminates at Baltimore Cemetery, which perhaps is appropriate because Baltimore Cemetery is the final resting place for the Von Der Horst family. 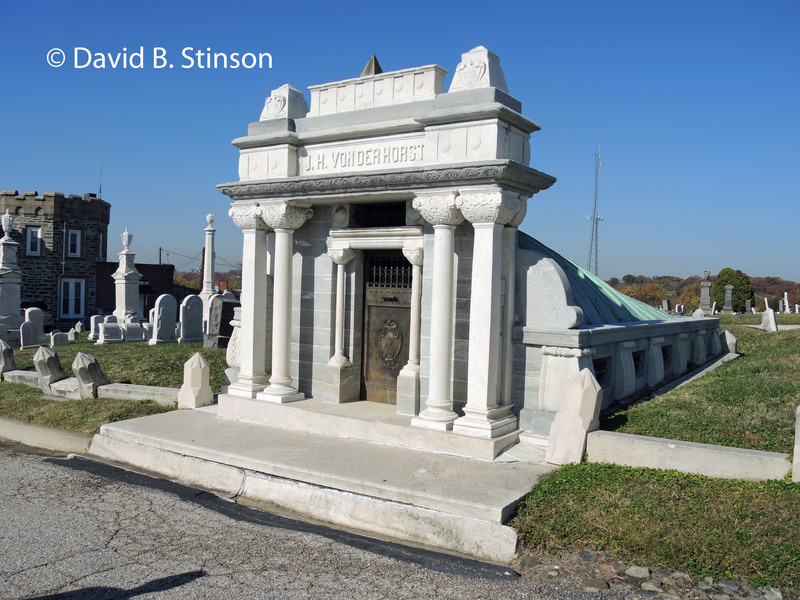 In 1894, John Von Der Horst died and was interred in a mausoleum near the entrance to Baltimore Cemetery. 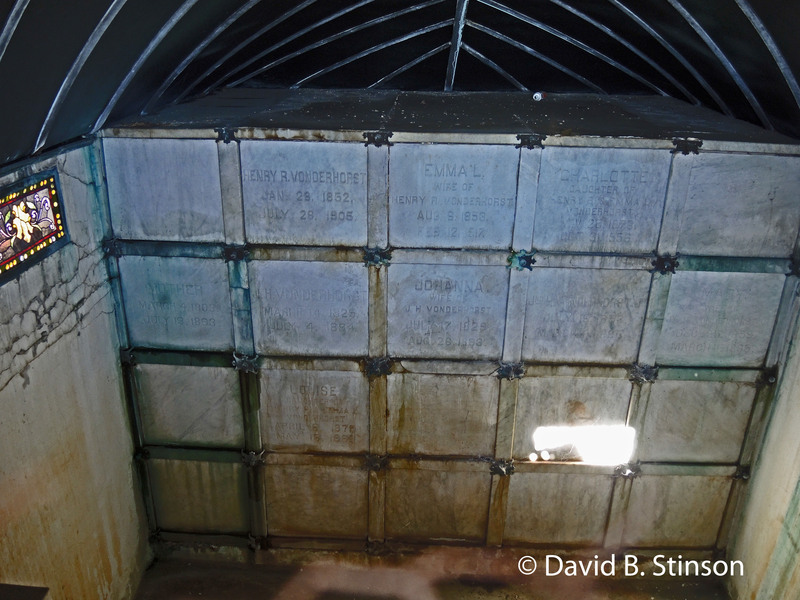 Also interred in the family vault is John’s wife Johanna, and his son John H. Von Der Horst, Jr., and his wife Mary. After his father’s death in 1894, Harry Von Der Horst inherited a large portion of the brewery and formed Von Der Horst Brewing Company. 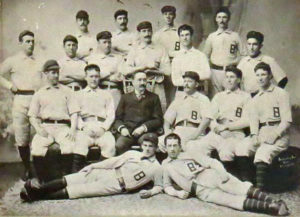 In 1898, Harry Von Der Horst moved to New York, where he was part owner of the Brooklyn Superbras (which included several former Oriole players, including manager Ned Hanlon). 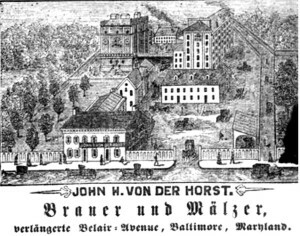 In 1899, Von Der Horst Brewing Company became part of the Maryland Brewing Company, a consolidation of 16 or 17 Baltimore breweries. 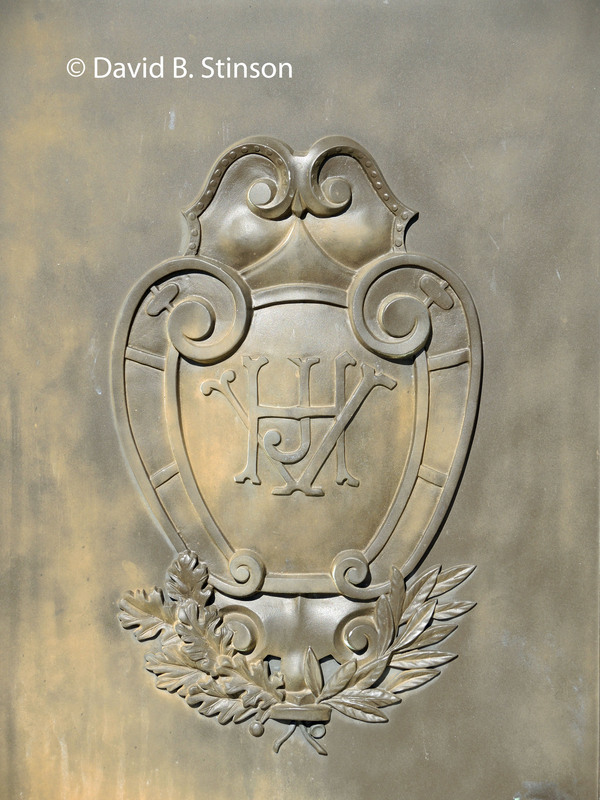 Harry Von Der Horst retained a share of that company, but eventually sold his shares to the Gottlieb-Bauernschmidt-Strauss Brewing Company. 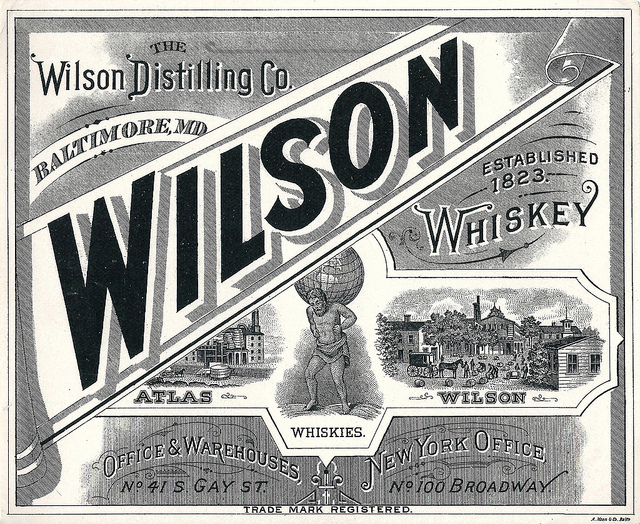 By 1904, Gottlieb-Bauernschmidt-Strauss had ceased making beer at the Eagle Brewery site and leased the former Von Der Horst property to Wilson Distilling Company. 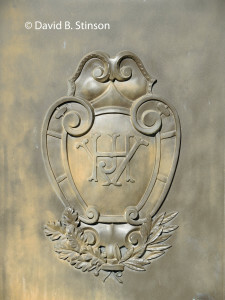 Harry Von Der Horst died in New York in 1905, and is interred in the Von Der Horst vault along with his wife Emma, and his daughters Charlotte and Louise. 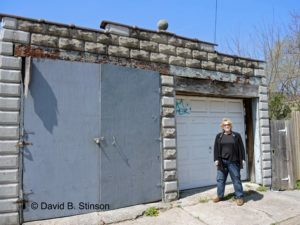 As for the former brewery site, during prohibition, the property was used to make alcohol products not intended for human consumption, although stories in the Baltimore Sun talk of bootlegging raids on the premises. In the 1930s, a car dealership, Backus Chevrolet, opened at the site, and in 1938, H.J. Weissner converted the dealership to a used car lot. 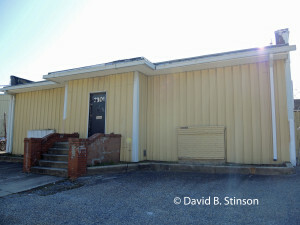 In the 1980s a Church’s Fried Chicken restaurant was located at the site. 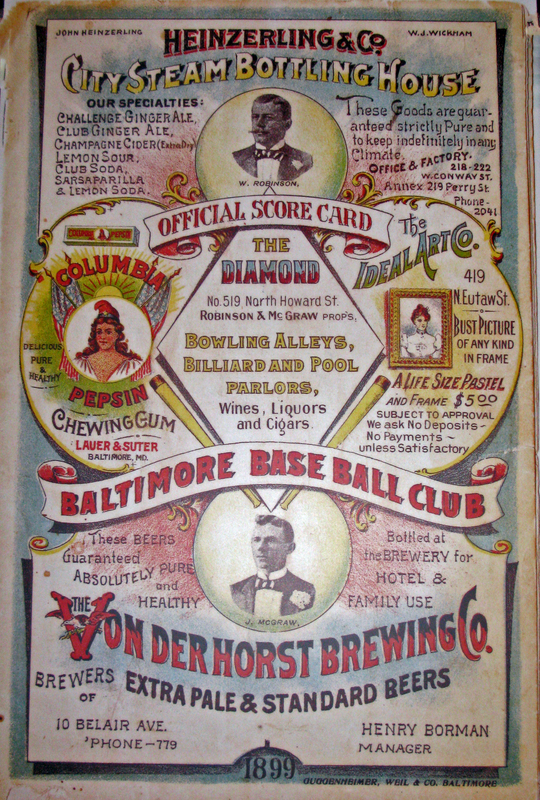 During his time as a baseball executive in Baltimore, Harry Von Der Horst brought the city three baseball championships, in 1894, 1895, and 1896. He also owned and/or helped construct three ballparks to house his teams. 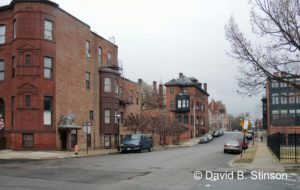 The first was Oriole Park (Oriole Park I), known as Huntington Avenue Grounds and American Association Park), at the southeast corner of what is now East 25th Street and Barclay Street. 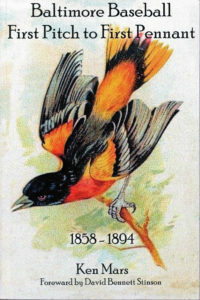 The American Association Orioles played there from 1883 to 1889. 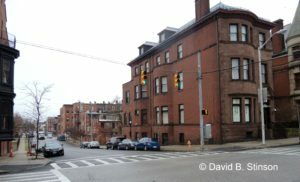 The second was Oriole Park II, located at the southwest corner of what is now Greenmount Avenue and East 29th Street, where the American Association Orioles played from 1890 to 1891. 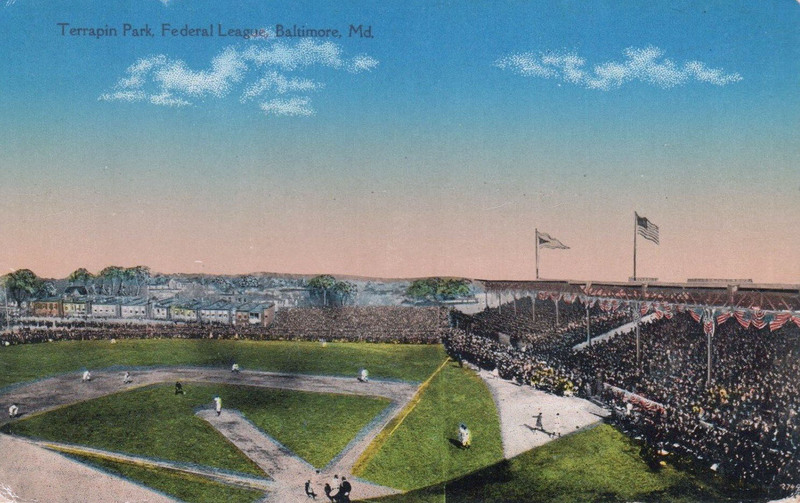 The third was Oriole Park III, also known as Union Park and the Baltimore Baseball and Exhibition Grounds, where American Association Orioles played in 1891. The National League Orioles played at Union Park up through the 1899 season. Baltimore Cemetery sits on one of the highest spots in the City of Baltimore, approximately three miles northeast of Camden Yards, the home of the current Baltimore Orioles. 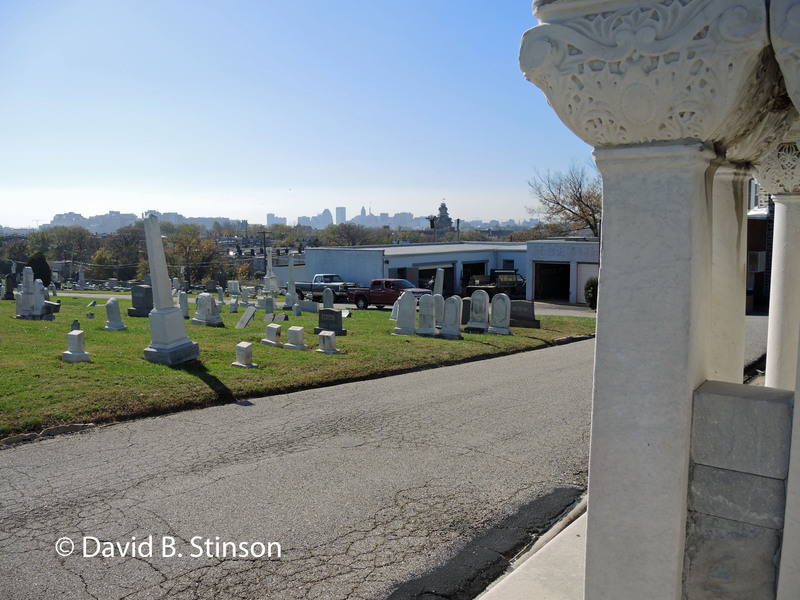 Although the neighborhood has changed dramatically since Harry Von Der Horst’s death, it seems fitting that the city skyline is readily visible from the front steps of the final resting place of the man who first brought together Baltimore baseball and beer. Friday September 25th marks the start of the 2015 Baltimore Book Festival. 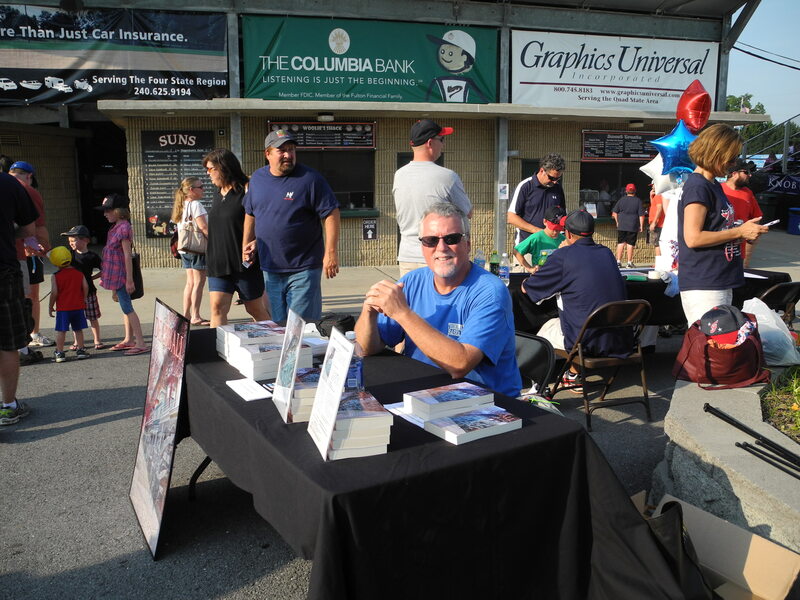 I am looking forward to attending once again (my fourth year in a row) and will be in the Author’s tent on Friday, from 11 am to 7 pm, selling and signing copies of Deadball, A Metaphysical Baseball Novel, as well as my new, non fiction book, The College Baseball Primer. 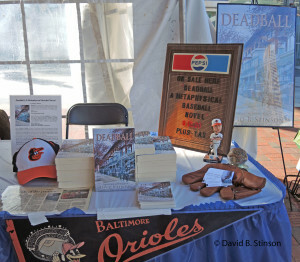 That evening, at 6:30 pm, I will be appearing at the Speaker’s Stage adjacent to the Author’s Tent, talking about Deadball and Baltimore’s lost ballparks of baseball. This year marks the second year in a row that the Baltimore Book Festival has been held at the Inner Harbor. 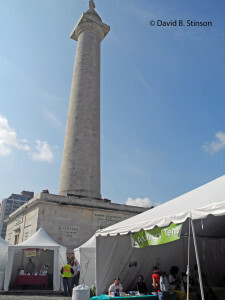 In previous years, the Festival was held in the Mount Vernon neighborhood of Baltimore, adjacent to the Washington Monument. Both locations had their advantages. 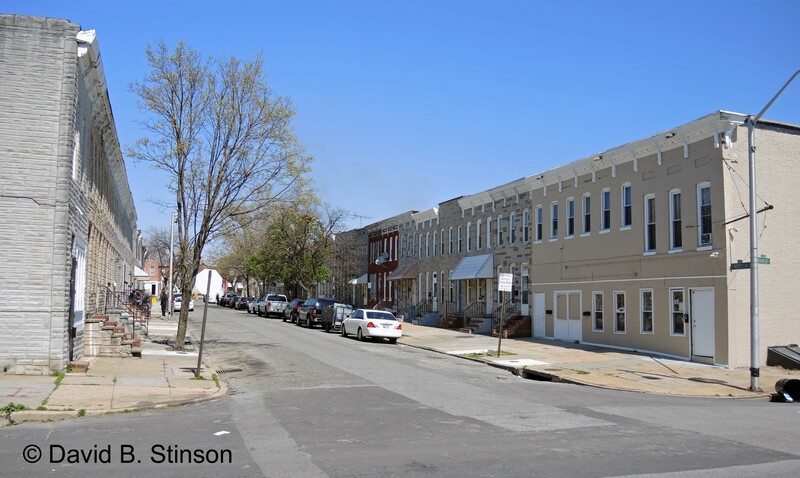 Mount Vernon had a wonderful, neighborhood feel, surrounded by beautiful turn of the century buildings. 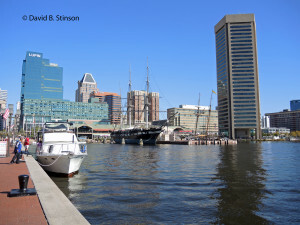 The Inner Harbor brings more foot traffic to the festival, with its central, downtown location. If you are planning on attending the Festival on Friday, please stop by the Authors Tent and say hello. Or, come heckle me during my appearance at the Speaker’s Stage. Either way, it will be great to see you. 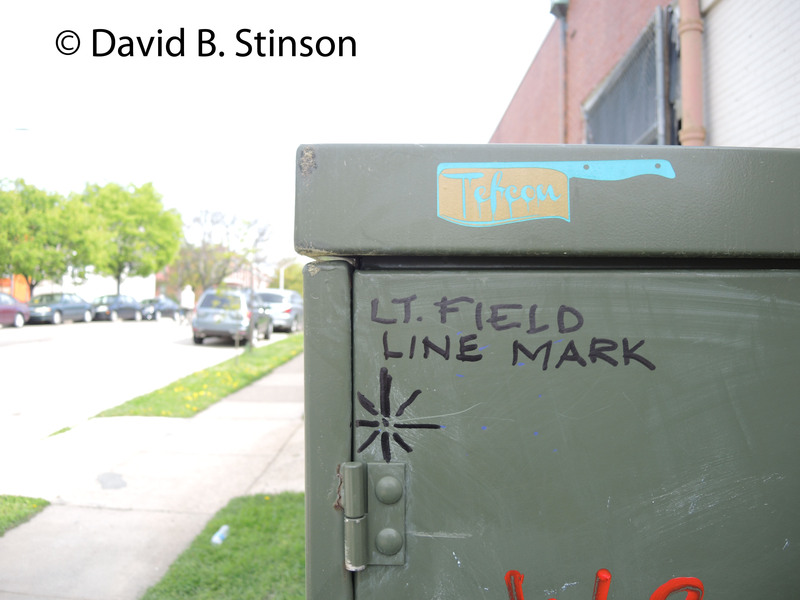 This entry is filed under DBS Blog and tagged 2012 Baltimore Book Festival, 2014 Baltimore Book Festival, Baltimore, Baltimore Book Festival, Deadball A Metaphysical Baseball Novel, Inner harbor Mount Vernon Neighborhood, Maryland, Speaker's Stage, The College Baseball Primer. 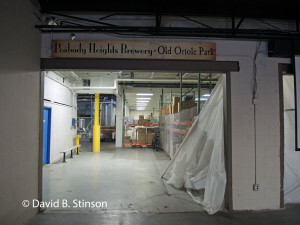 Peabody Heights Brewery in Baltimore, Maryland, is located on the former site of Old Oriole Park, once home to the Federal League Baltimore Terrapins and the International League Baltimore Orioles. 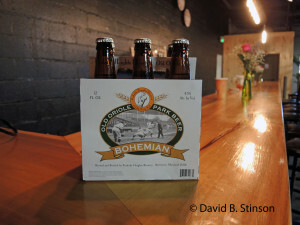 In honor of that heritage, the brewery has released a new beer, Old Oriole Park Bohemian. The bottle’s label includes a photograph of a player at Old Oriole Park sliding into home plate, with the grandstand near the left field corner as the backdrop. 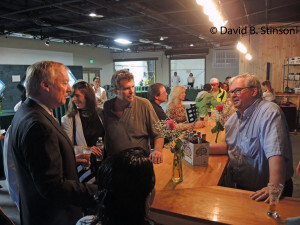 On June 27, 2015, Richard O’Keefe, the owner of Peabody Heights Brewery, and J. Hollis Albert, III, General Manager of the brewery, welcomed guests to celebrate the official opening of the tasting room, which is located in what was once left field at Old Oriole Park. 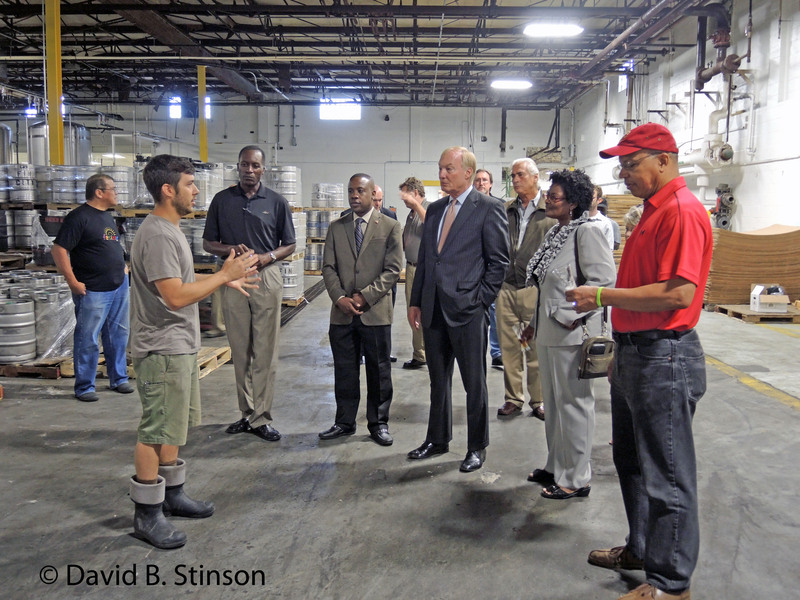 Several local dignitaries were in attendance, including Maryland Lt. 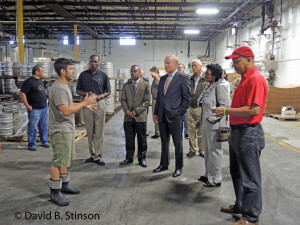 Governor Boyd Rutherford, Maryland Comptroller Peter Franchot, Baltimore Orioles Minority Owner Wayne Gioioso, Sr., and Delegate Mary Washington. Brewer Eli Breitburg-Smith gave a tour of the brewery. In the photo below, Brewer Breitburg-Smith and those assembled are standing in what was once center field. 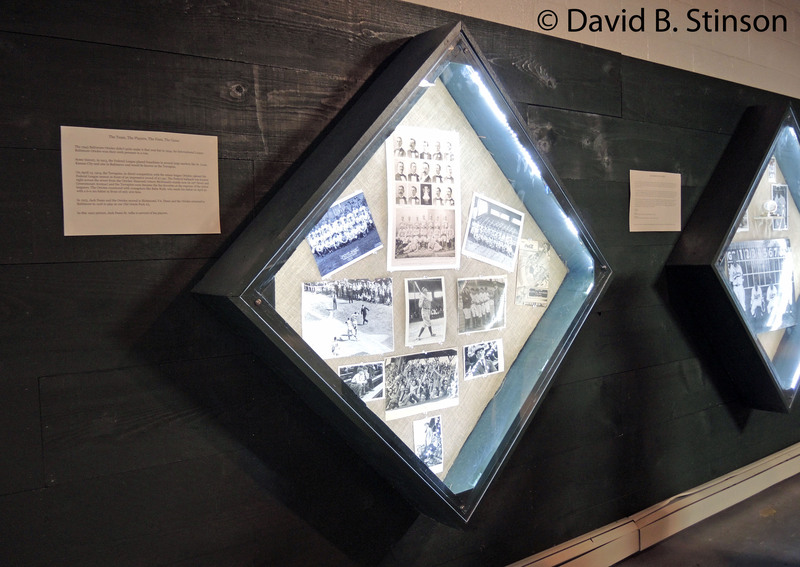 The left field tasting room includes displays that celebrate Baltimore baseball history, including Old Oriole Park, as well as baseball artwork that captures the spirit of the game. 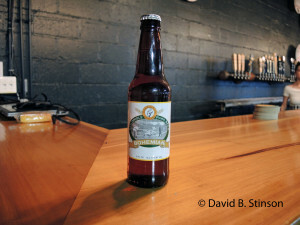 The tasting room is now open to the public every weekend, typically from 5-7 pm on Fridays and 11 am to 4 pm on Saturdays. If you are a fan of the game and/or a fan of beer, be sure to stop by the left field Tasting Room at Peabody Heights Brewery. 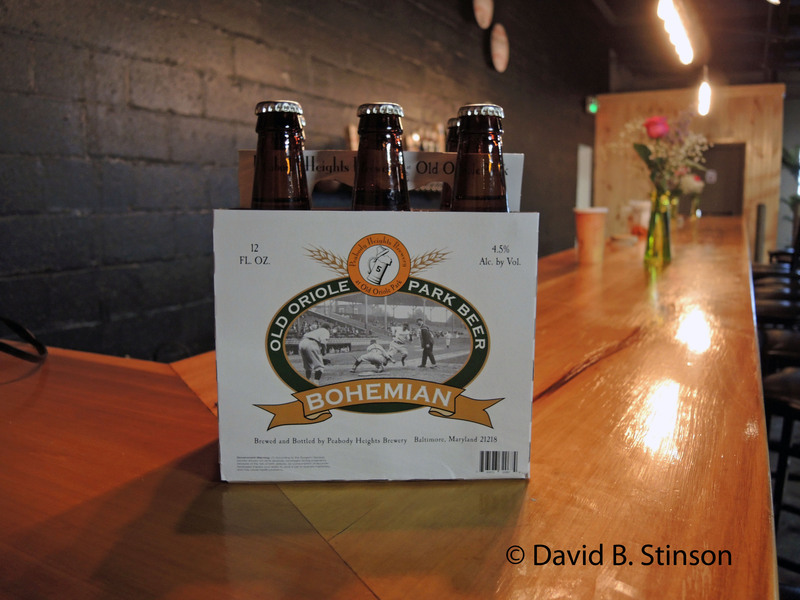 And while there, have a bottle of Old Oriole Park Bohemian on the very spot depicted in the label of the bottle that you are holding. 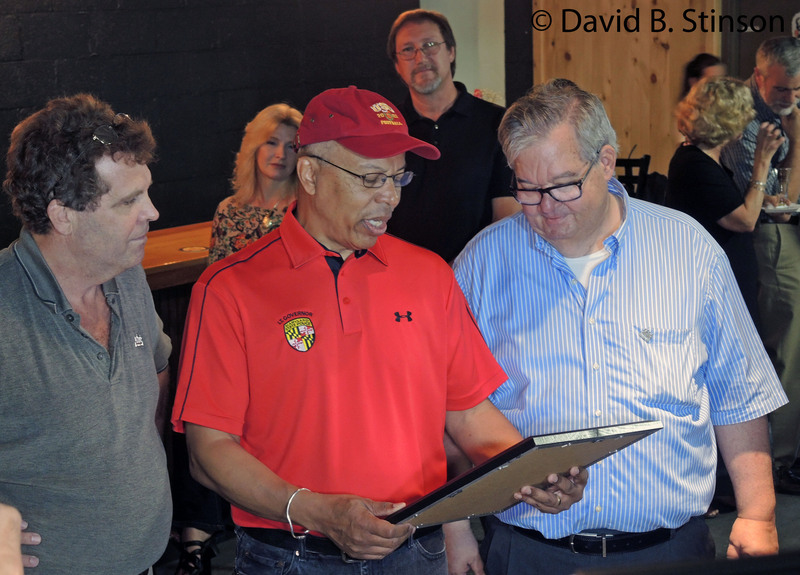 This Saturday Night, June 20th, the Hagerstown Suns are holding “Washington County Baseball Heritage Night,” as part of the Suns’ 35th Anniversary celebration at Municipal Stadium. I am honored to be participating in a book signing during the game, along with local authors Bob Savitt (The Blue Ridge League) and Austin Gisriel (Boots Poffenberger: Hurler, Hero, Hell-Raiser). In case you are wondering why I would be included as part of the Washington County Heritage Night, my book Deadball: A Metaphysical Baseball Novel, prominently features Municipal Stadium. Former Washington County Big Leaguers or their families will be in attendance Saturday night as well. Included in the list of players who made it to the Majors is John Wilson (1913), Ike Powers (1927-1928), “Boots” Poffenberger (1937-1939), Vic Barnhart (1944-1946), Dave Cole (1950-1955), Leo Burke (1958-1965), Mike Draper (1993) and Nick Adenhart (2008-2009). The Suns also are honoring Mickey Billmeyer, a major league coach, and Clyde Barhnhart, a long-time county resident and father of Vic Barnhart. And if that isn’t enough, the first 1,000 fans receive a free poster featuring Hagerstown Suns players from years past. This entry is filed under DBS Blog and tagged 35th Anniversary Celebration, Austin Gisriel, Bob Savitt, Boots Poffenberger, Deadball A Metaphysical Baseball Novel, Hagerstown Suns, minor league baseball, Municipal Stadium. 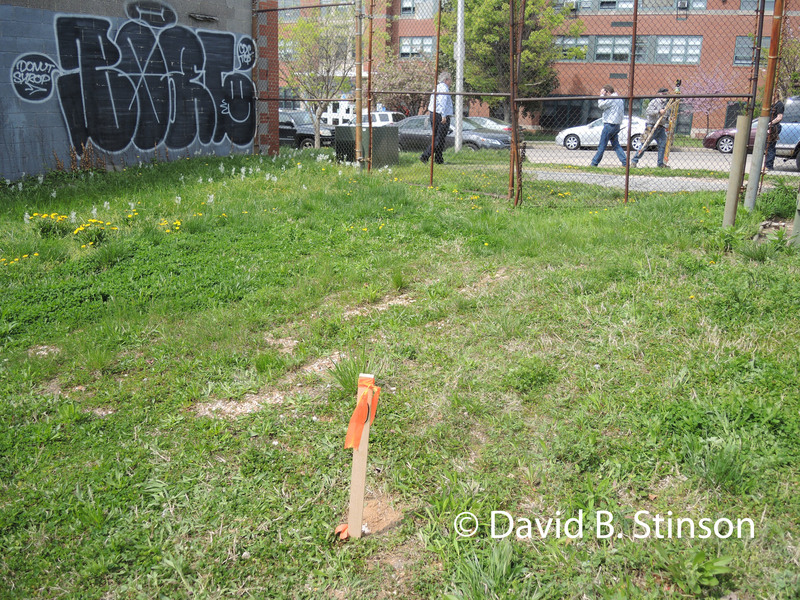 For several years I have wondered about the precise location of old Oriole Park’s home plate. 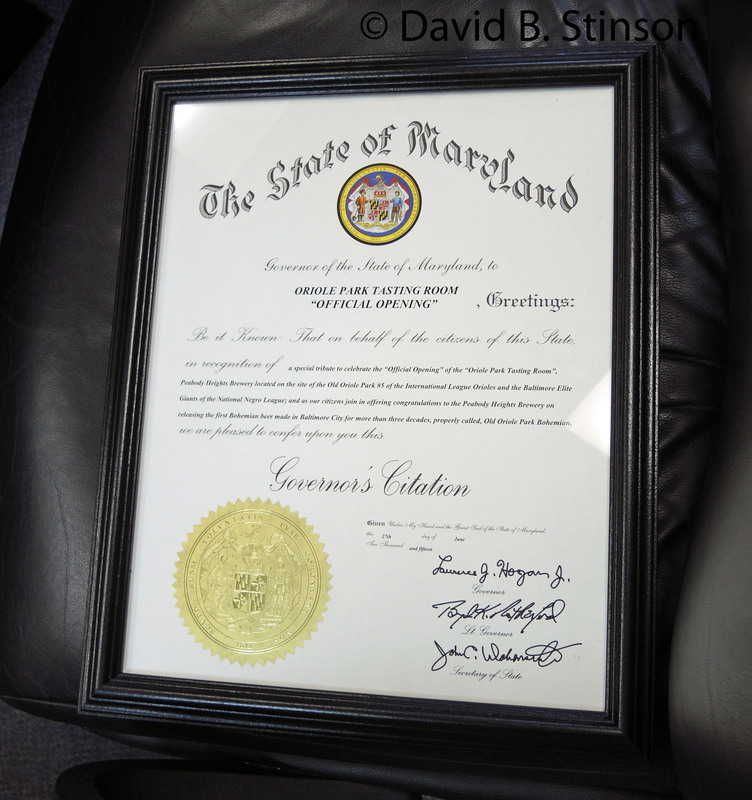 From 1914-1915 the ballpark was known as Terrapin Park and later Oriole Park (V). 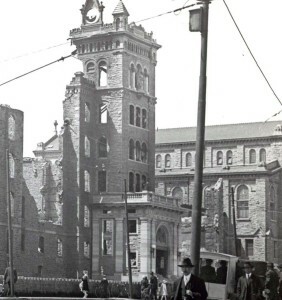 The ballpark burned down in 1944 and is now the site of Peabody Heights Brewery. This past Thursday, the mystery was solved. 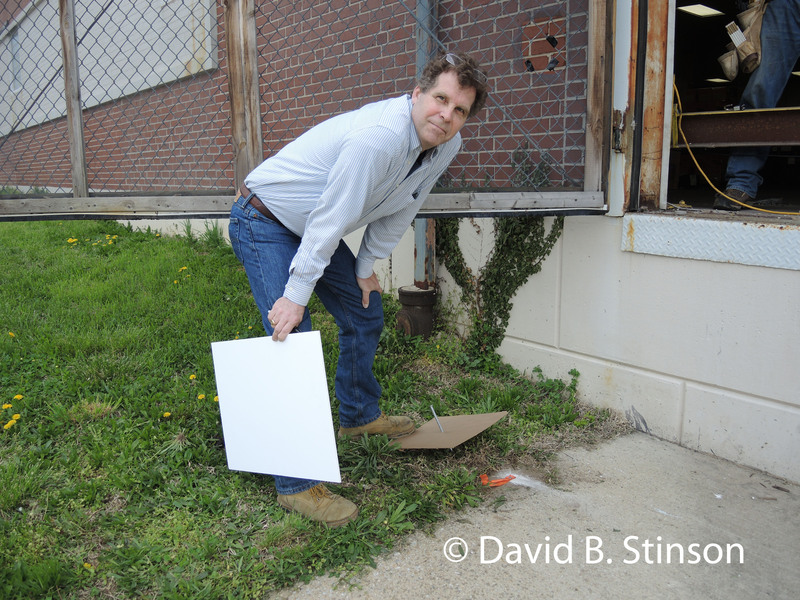 Richard O’Keefe and J. Hollis B. Albert III of Peabody Heights Brewery (which sits on a portion of the former ballpark site) arranged for a survey of the site to determine the location of home plate, as well as the infield and the outfield. Home plate was located on what is now a grass strip along Barclay Street, just south of the brewery and across the Street from the entrance to the Barclay School. The surveyors also determined the former site of the pitcher’s mound, which was located in a grassy patch of land just south of Peabody Heights Brewery. 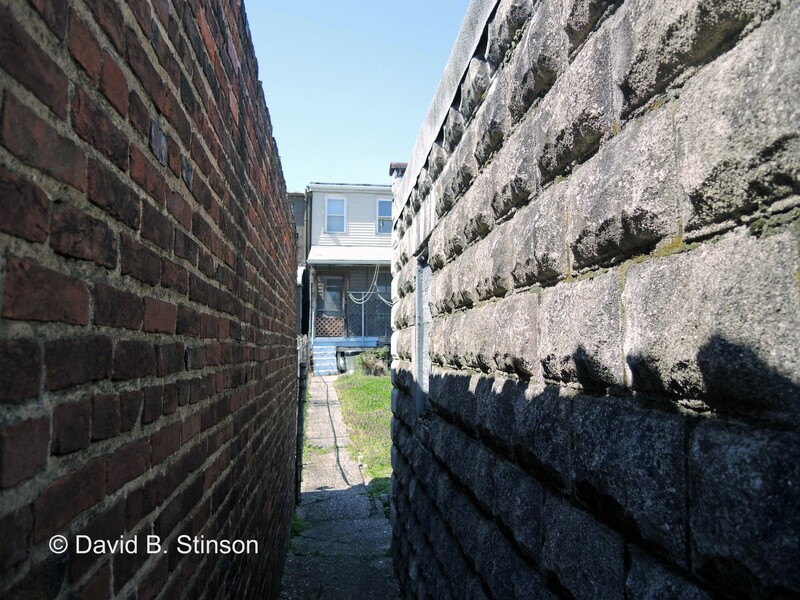 The left field foul line ran parallel to what is now Barclay Street. 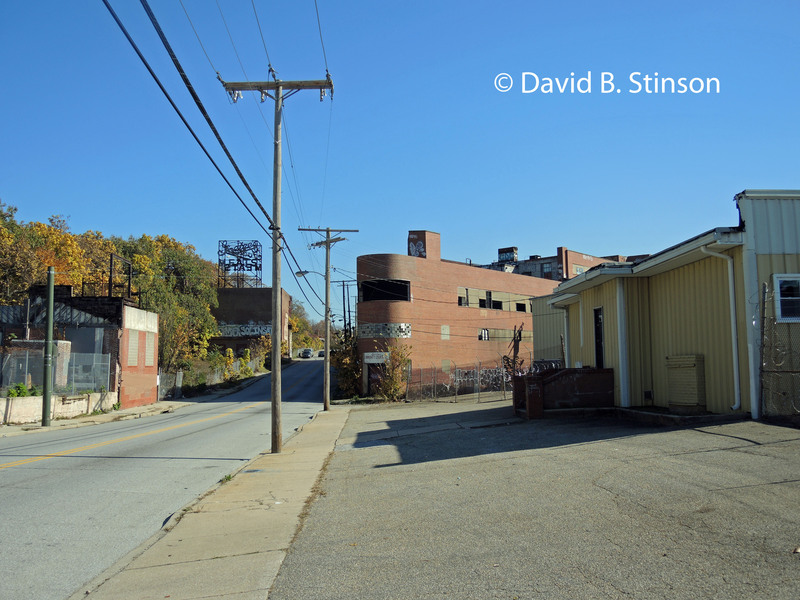 Third base was located next to what is now a loading dock for Peabody Heights Brewery on Barclay Street. 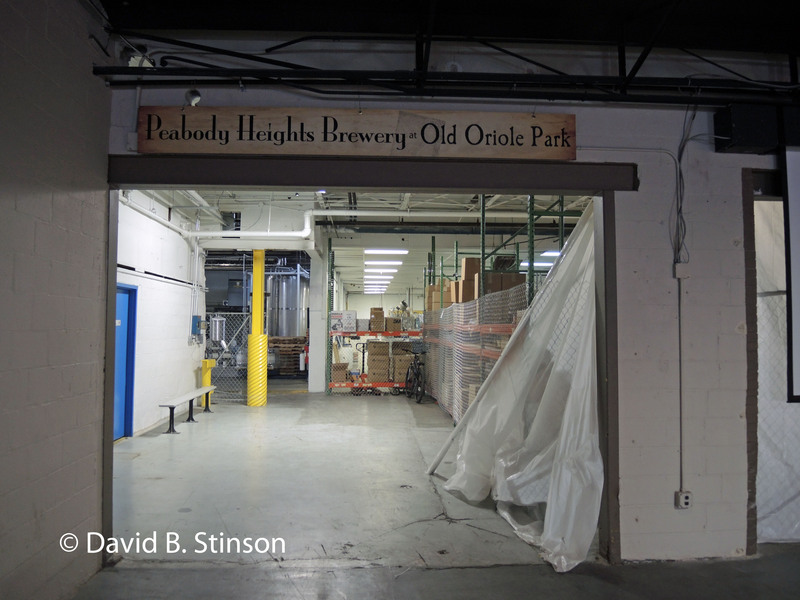 Peabody Heights Brewery is in the process of putting together a display about old Oriole Park. Second base was located inside the brewery and Peabody Heights Brewery plans to include it as part of its brewery tour. The tap room/tasting room will include a recreation of the old Oriole Park grandstand with a display and information about old Oriole Park, as well as information about several other former professional ballparks that once dotted the area nearby. The Baltimore Sun’s Jacques Kelly, a baseball fan and historian who grew up nearby, wrote this fine article about the surveying at old Oriole Park. Be sure to stay tuned for more information.